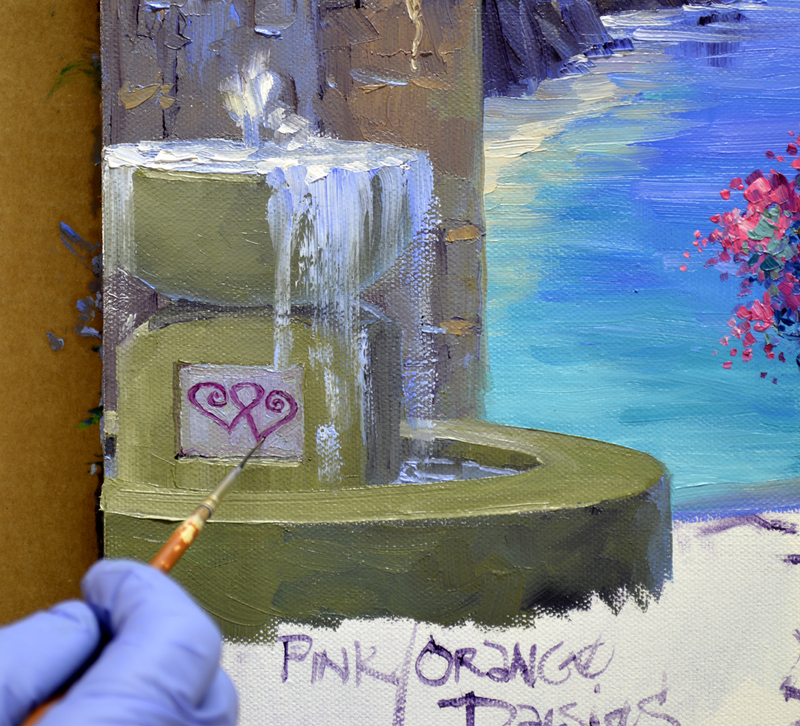 Today I’m working on embellishing one of our Limited Original Giclees on canvas. 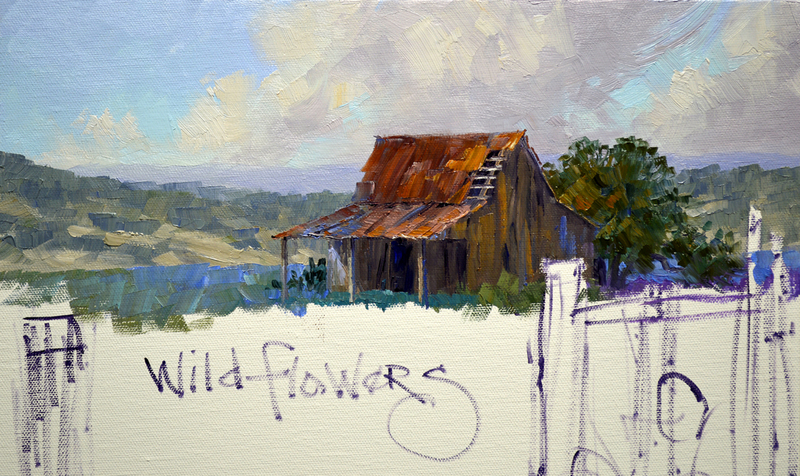 Here is the digital reproduction before any enhancing is done. 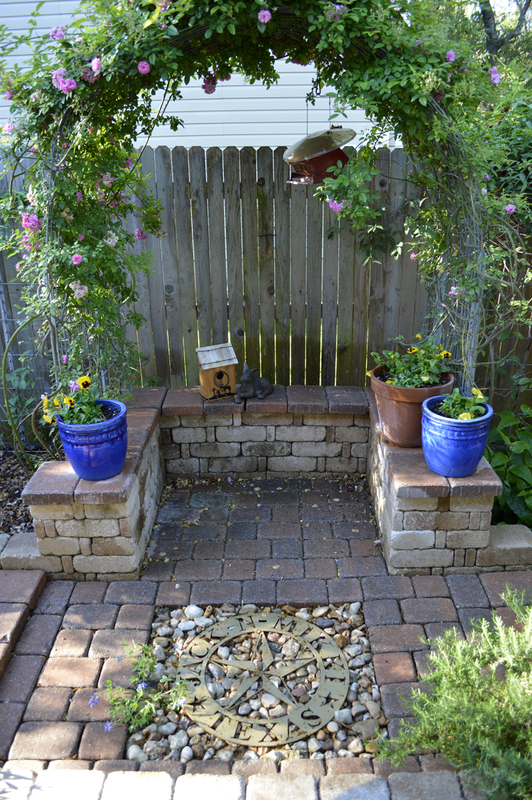 I did play a little on the Hollyhocks. You can see where I did a color test, I’m going to change them to a peachy yellow. The first step is to glaze the door, shutter and windows with a thin mixture of Viridian Green + Pthalo Blue + Liquin. This makes them a rich Turquoise Blue. 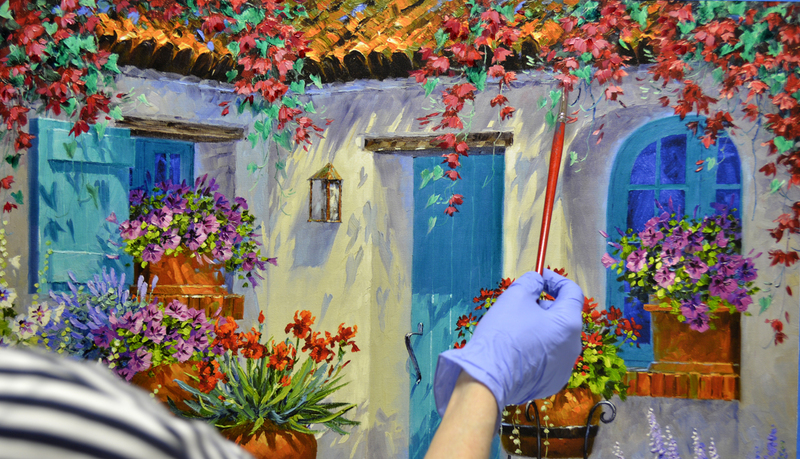 Next the flowers on the vine draping over the roof are repainted with mixes of Alizarin Crimson + White and Alizarin Crimson + Cadmium Red Light + White. Please remember as you go through my blog, to see any of the pictures larger just click on the image. Silver Pony Foot Vine cascades out of the Geranium container. 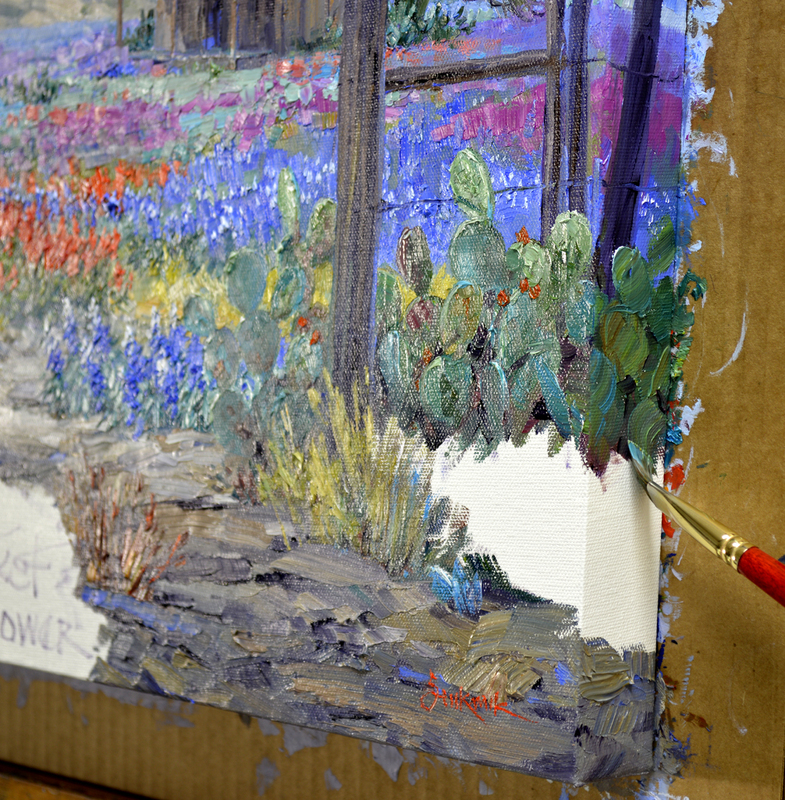 The tiny, hoof shaped leaves are repainted using a #4 Bright (Square) brush. Now for the changeover on the Hollyhocks. The large blossoms are completely redone with combinations of Permanent Rose + Cadmium Yellow Light + White, Permanent Rose + White and Cadmium Yellow Medium + Cadmium Yellow Light + Permanent Rose + White. Pure White is used to highlight the stucco wall where it’s illuminated by the brilliant sunshine. 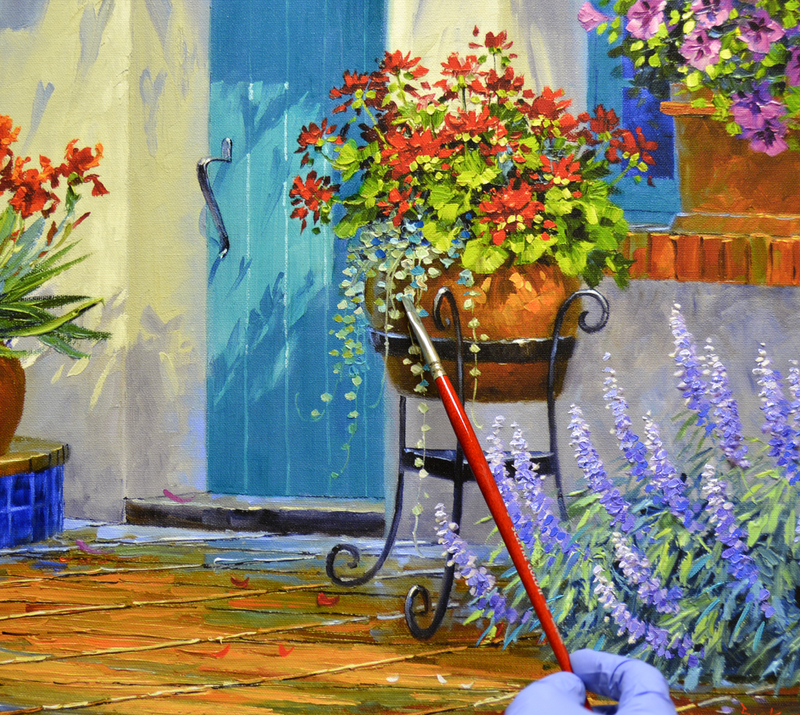 We’ll finish out the Geraniums with heavy brush strokes of Cadmium Red Deep, Cadmium Red Medium and Cadmium Red Light. 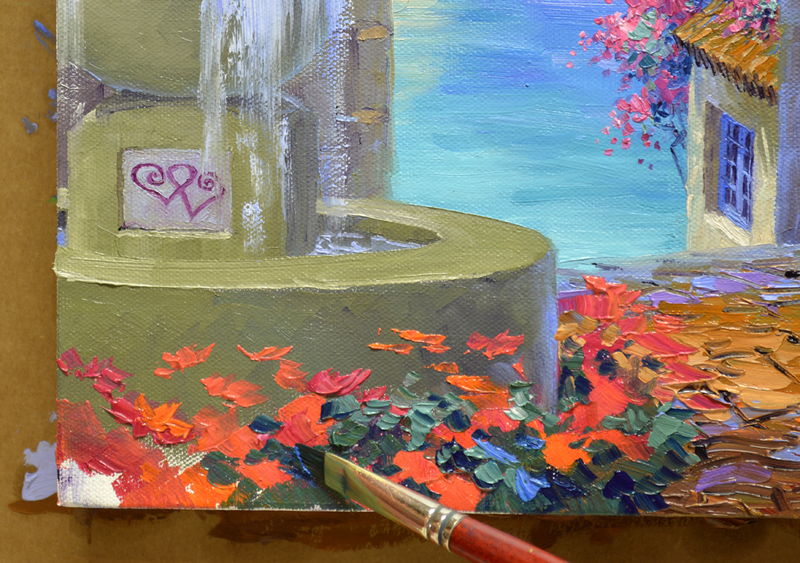 A bit of White is added to the Cadmium Red Light for the lightest petals. 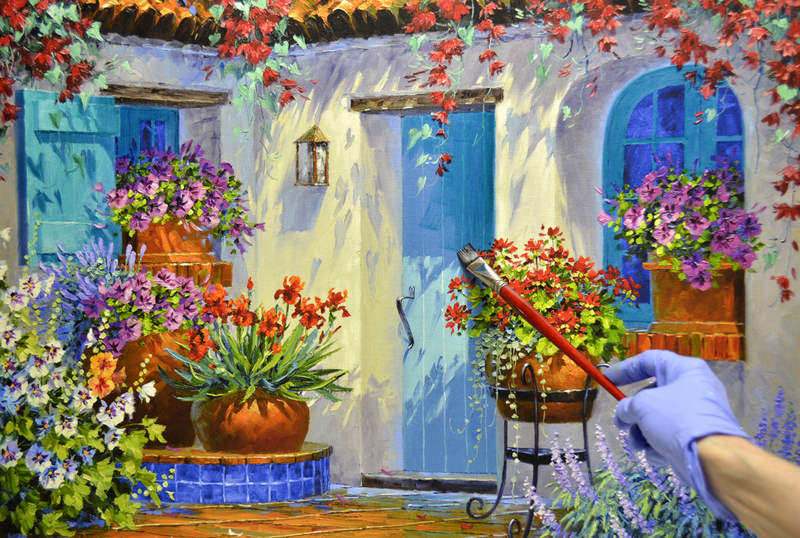 Irises, Petunias and the Salvia are all repainted and we’re finished. 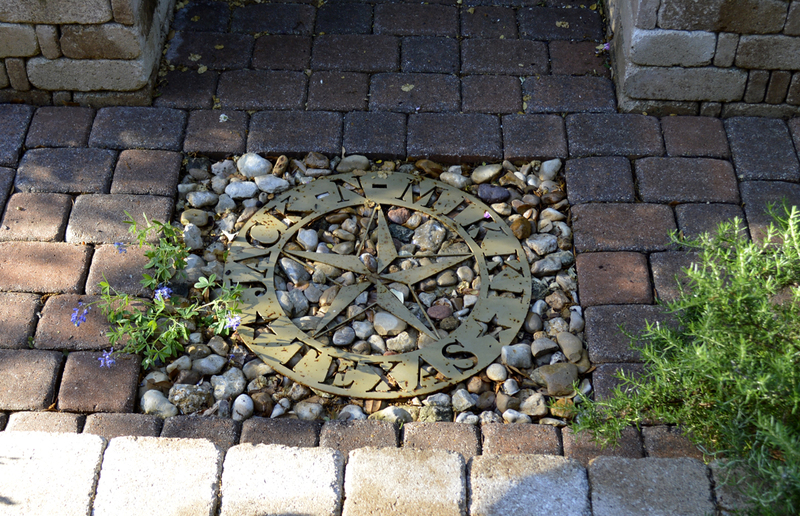 A Kiss of Sunshine makes our pleasant entry courtyard sparkle. Compare the image above to the very first one on today’s blog and you’ll see what a different the hand embellishment makes. It’s fun to make changes. 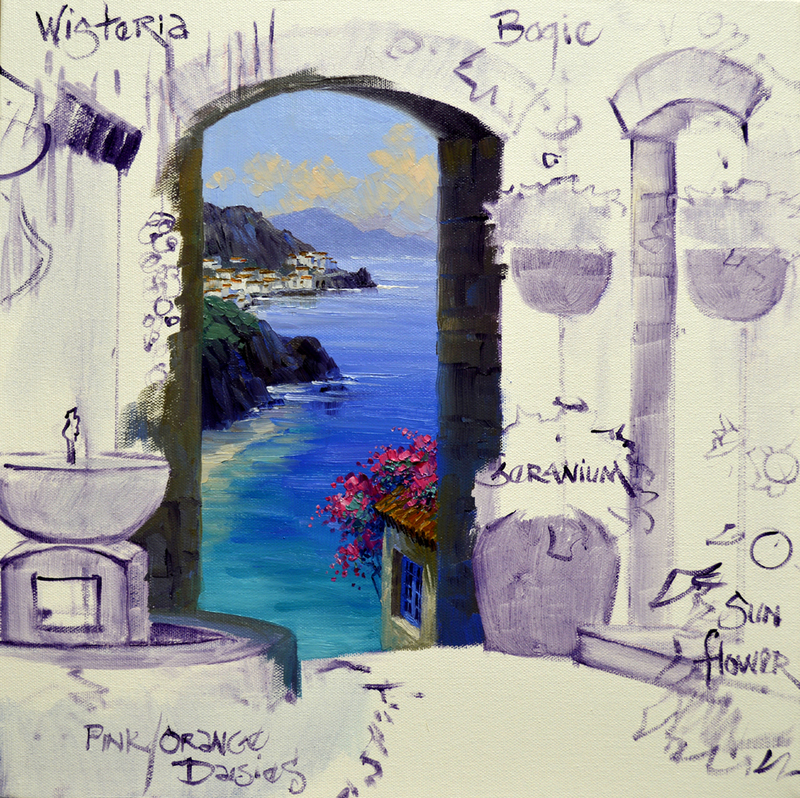 Each giclee is part of a Limited Edition but every piece is different, thus Original. So that’s why we call our embellished giclees LIMITED ORIGINALS. COBBLESTONES! The entire area of the walkway is covered, establishing the light and shadow pattern on the stones. Lots of texture is used, this will help to give the feeling of the rough cobbles. Perspective lines are added in a random pattern. I let my brush dance along the edges of the thick paint strokes. Next the horizontal crevices between the stones are made. 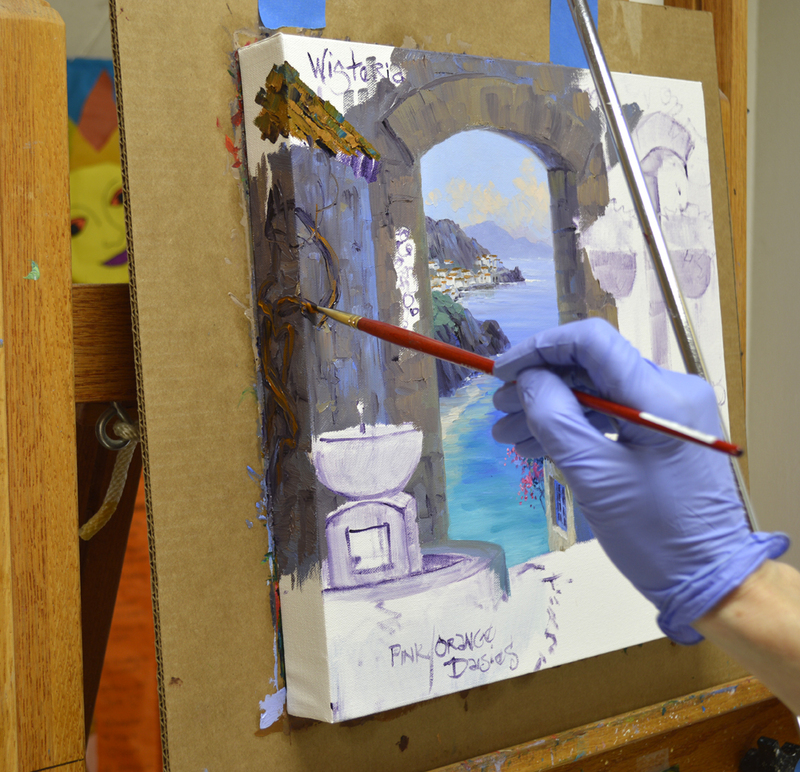 The canvas, mounted to a cardboard backing, is removed from the easel and laid flat to work on the bottom side of the painting. My supervisor, Molly, is asleep on the job! African Daisies parade along the base of the fountain. They are blocked in following my usual sequence of Flowers First, Leaves Last. 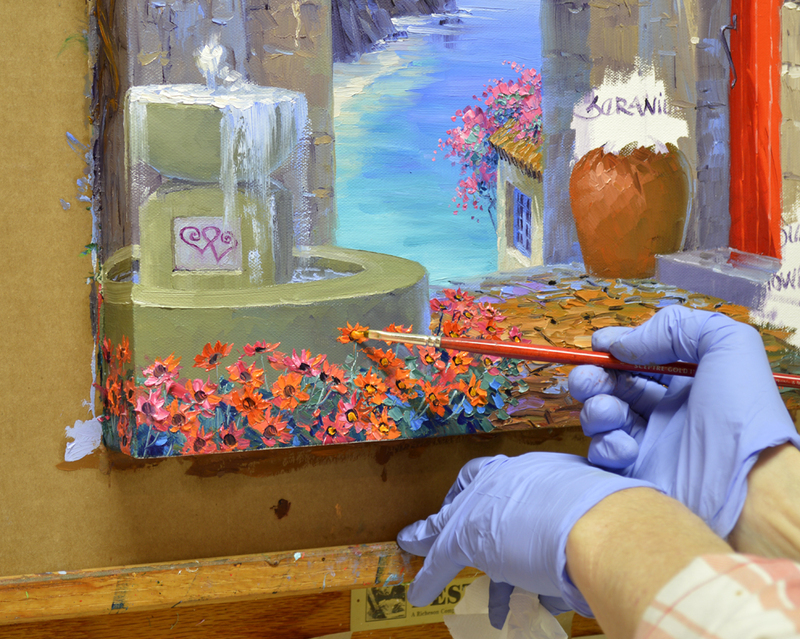 Dark centers are applied with a mix of MUD (Ultramarine Blue + Alizarin Crimson) + Liquin. 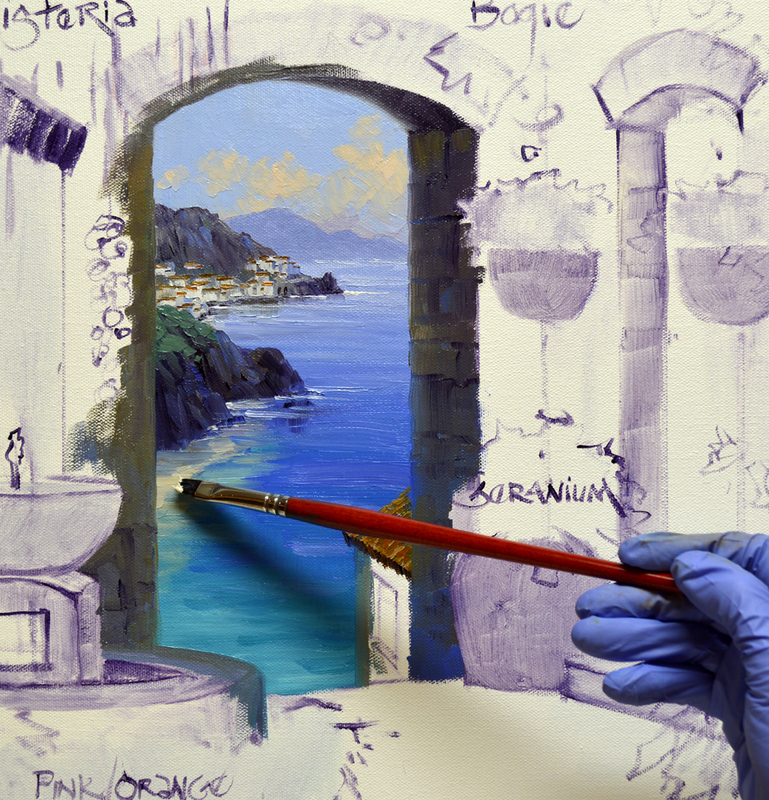 Then a dab of Cadmium Yellow Medium is placed in the middle of the dark spot. To finish, a tiny speck of the dark mixture is put in the center of the yellow. You may click on the image to enlarge it to see this better. 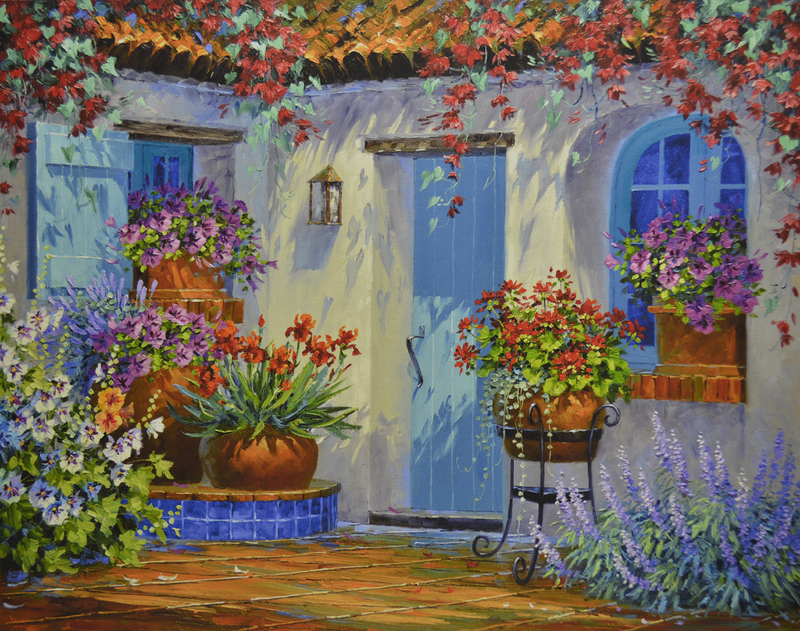 Geraniums are some of Roseann’s favorites! So we’ll fill all of the containers by the door with bright red ones. 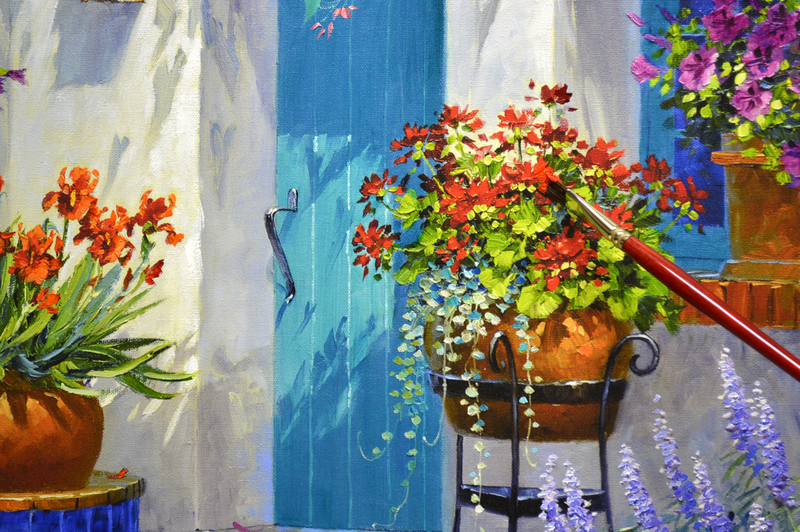 Cheery Sunflowers glow juxtaposed against the red door. I’m just so extremely blessed that God gave me the ability to capture people’s dreams on canvas and sent Jack into my life to teach me to paint. HE has gifted me with wonderful collectors too! With HUGS and COLORFUL SMILES! First off, thank you for all of your compliments on my Palette Painting. I wish I could take credit for the idea but years ago, over 20 in fact, Rob Pitzer of Pitzer’s Fine Arts asked his artists to do one for a special showing. 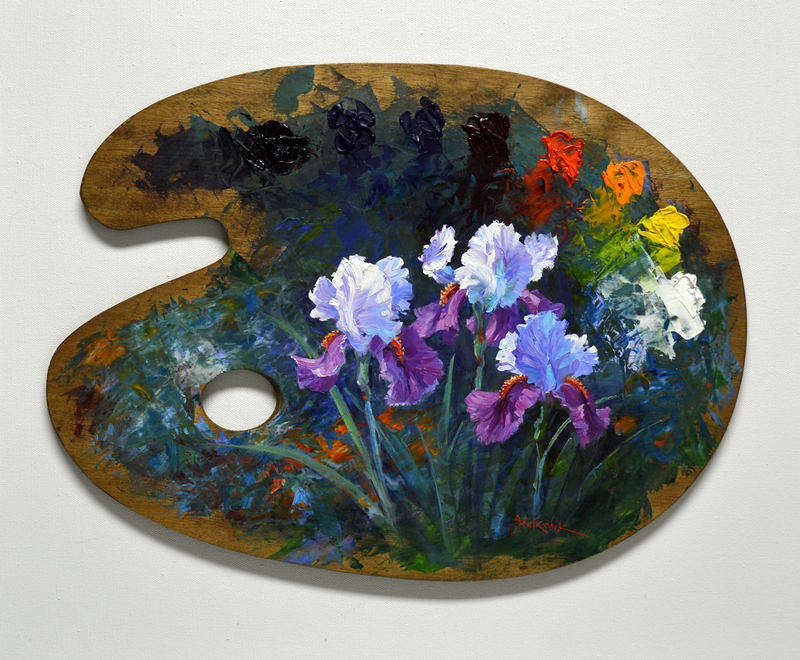 I had completely forgotten about them until a very good friend, Angel Ann said, “What about doing a painting on a palette?” So that’s how it came about. If you’d like to go to the auction CLICK HERE. But don’t linger, the auction that started at A PENNY ends Sunday night at 8 PM Central Time. All right, let’s get to work. The gnarled trucks of Wisteria are so cool. I love the way they wind this way and that. Garlic strands are seen everywhere in Italy, especially on the Amalfi Coast. 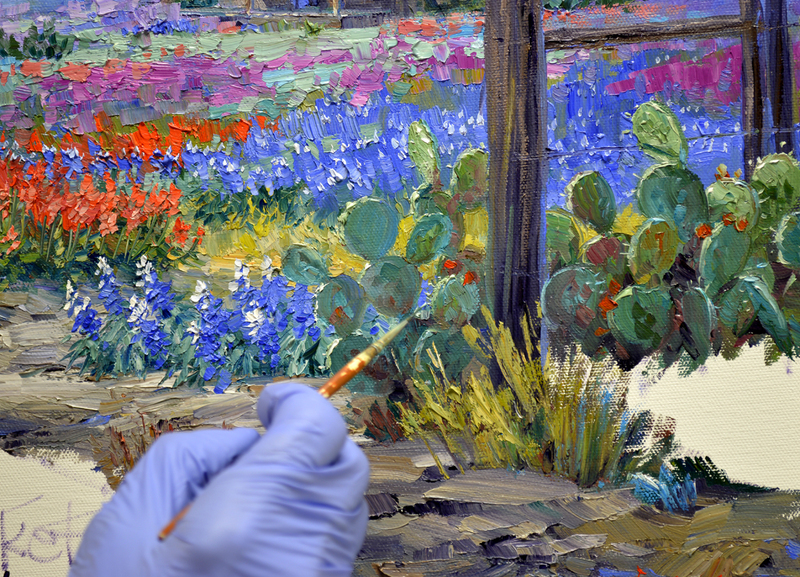 The rounded bulbs are painted first with mixes of White + Cadmium Orange + Ultramarine Blue, then the root end is delineated with a touch of Alizarin Crimson. 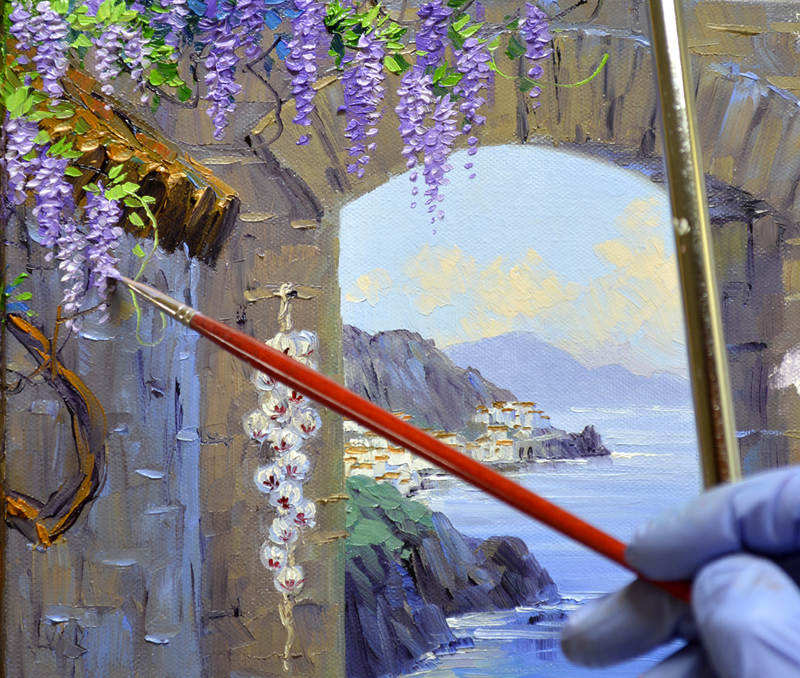 Moving back to the Wisteria, the blossoms are initially blocked in with mixes of Dioxazine Purple + White. Then the foliage is added with combinations of Viridian Green + Cadmium Yellow Medium. 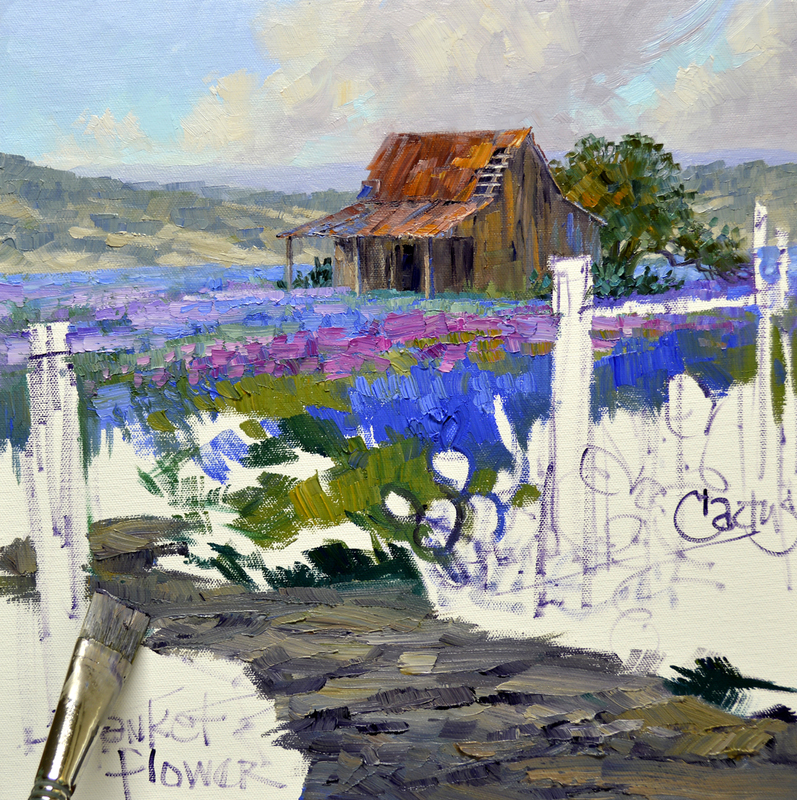 I come back and highlight the individual petals of the Wisteria blossoms using a lighter mix of White + Dioxazine Purple. The paint is applied with lots of texture. 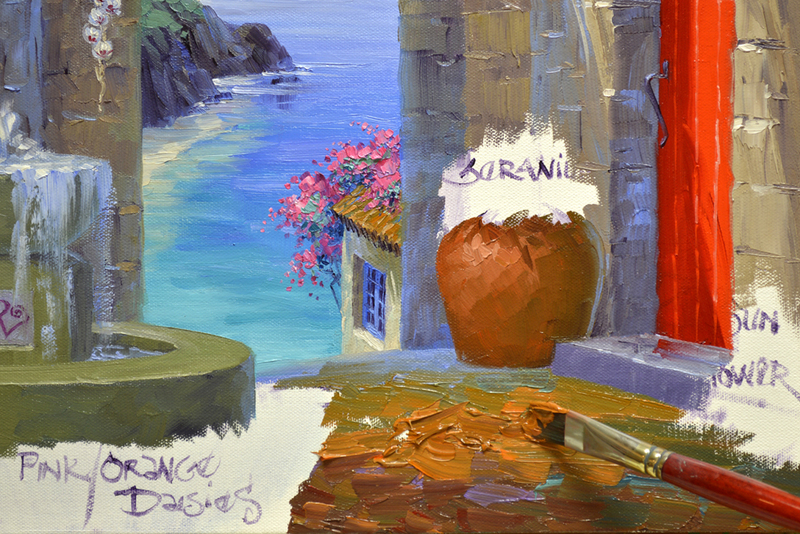 A Bougainvillea, Red Door and Terra Cotta containers bring additional color to the setting high above the Mediterranean Sea. 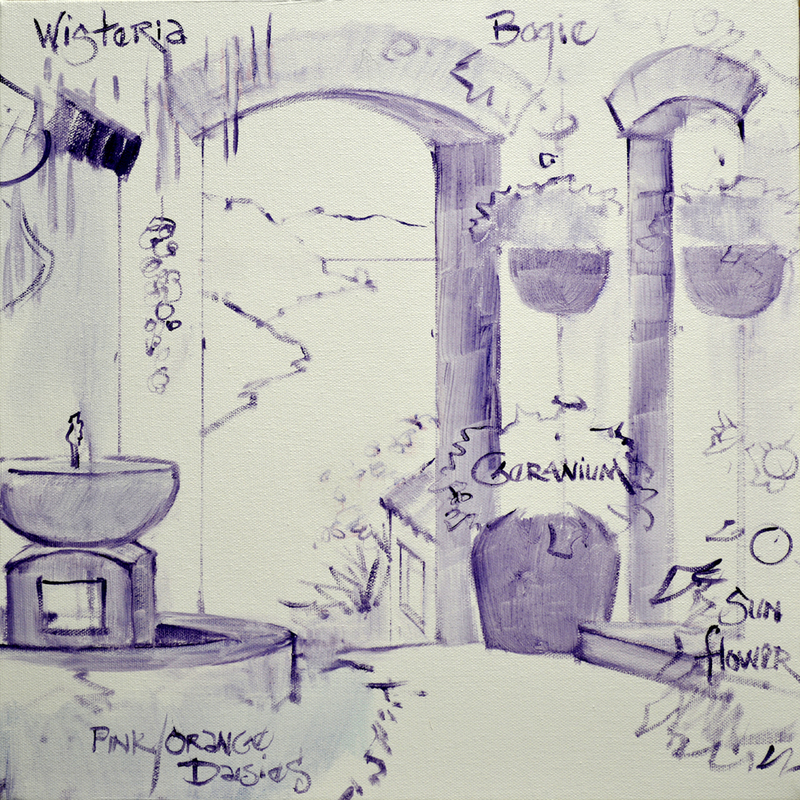 A fountain is painted with mixes of Viridian Green + Cadmium Orange + MUD (Ultramarine Blue + Alizarin Crimson) + White. Actually I did this commission several weeks ago, but it was a surprise Anniversary Gift so I couldn’t post it on my blog. Here is the piece my collector saw on my eBay auction, he tried to win it but was sniped at the very last second. So….Rick contacted me and asked me to do something especially for his lovely wife. 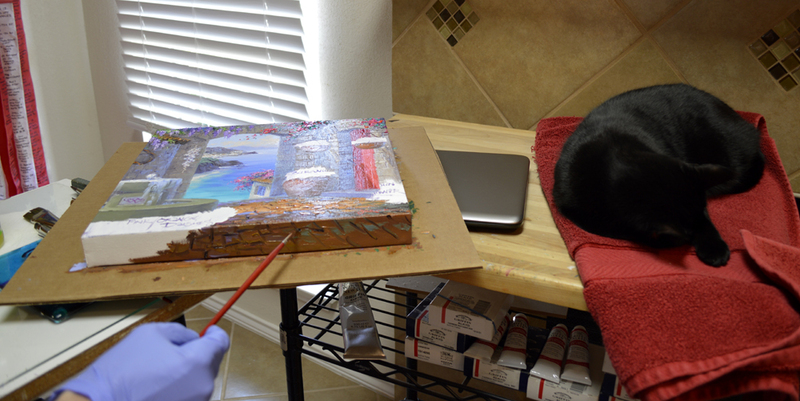 Now Roseann can watch her painting come together. 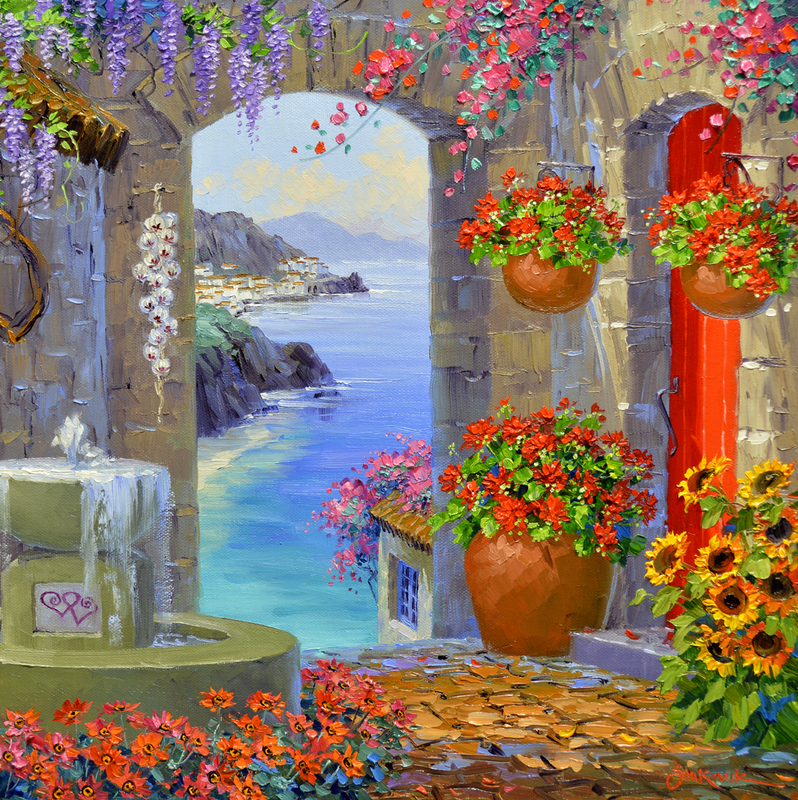 She loves Italy, flowers and fountains. 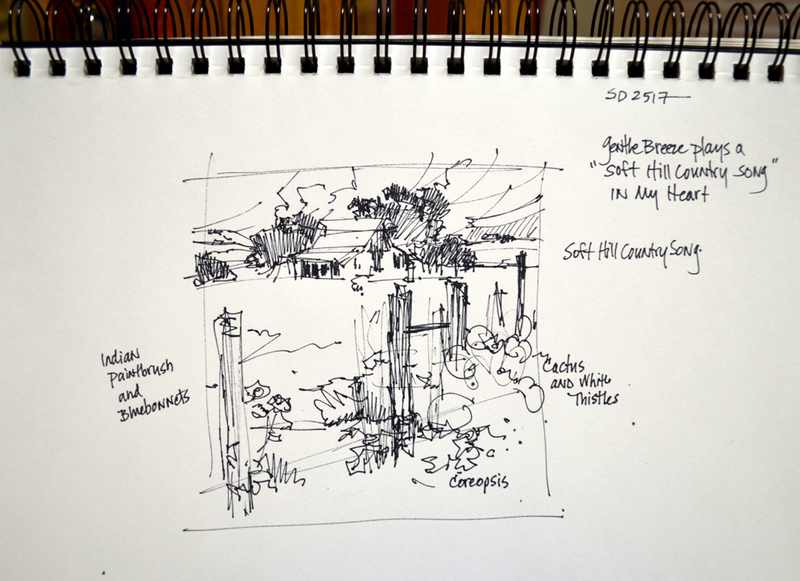 After visiting with Rick and discussing several ideas here’s what we came up with. 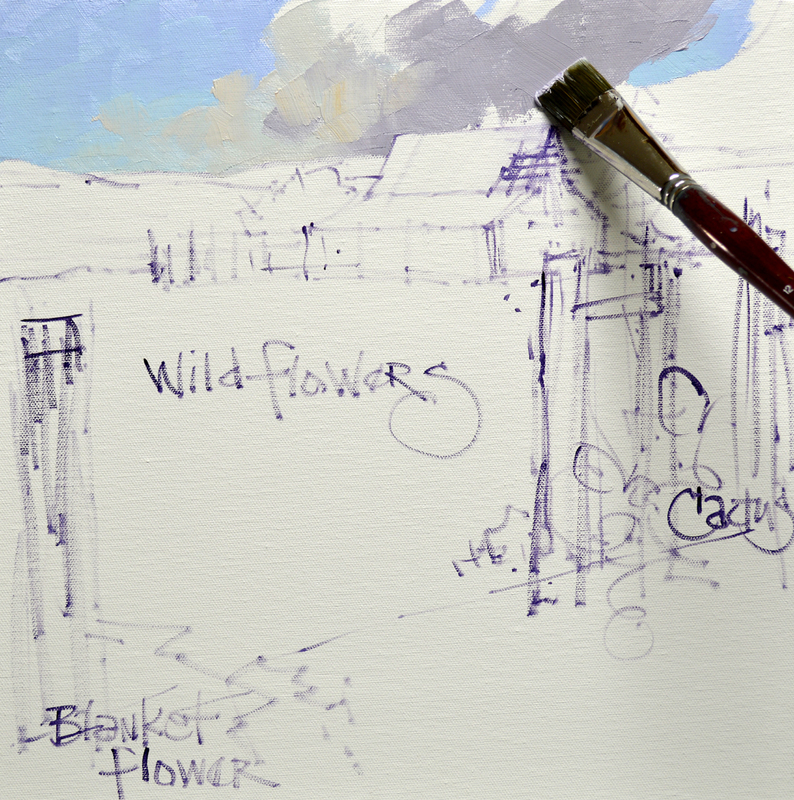 The basic plan is sketched up on the canvas with a thin oil wash of MUD (Ultramarine Blue + Alizarin Crimson) + Liquin. 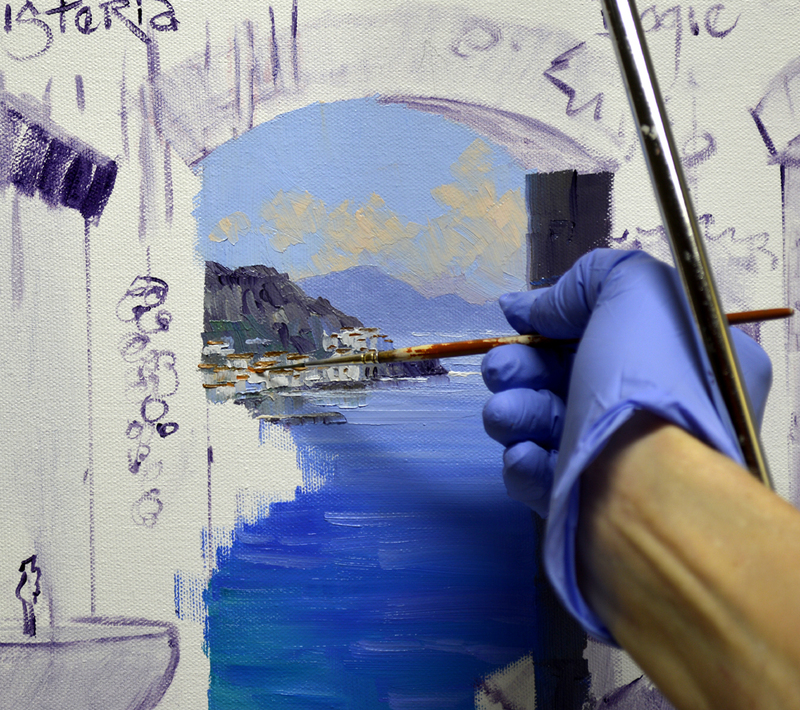 The distant scene through the archway is painted first, beginning with the sky. 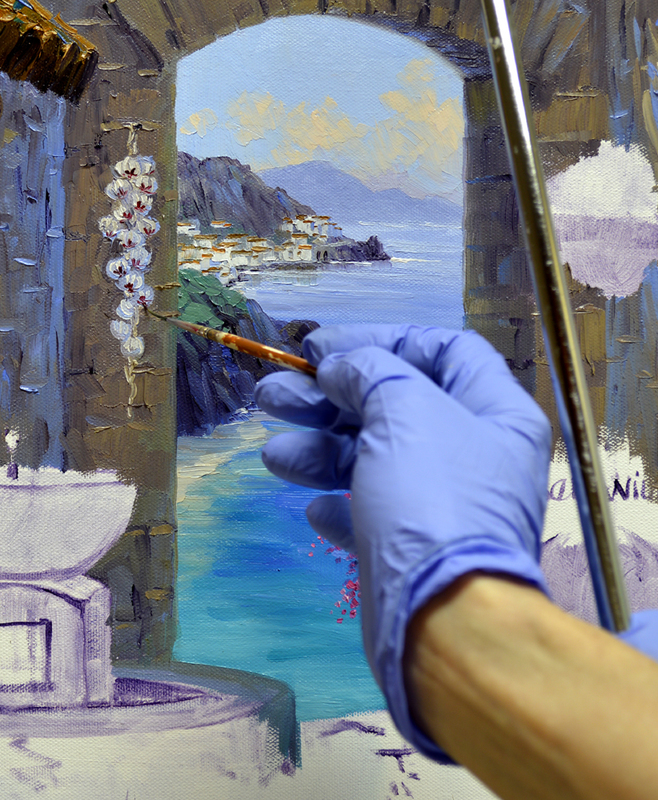 The farthest mountains along the Amalfi Coast are blocked in over the sky, then the water is painted. Notice how the water in the distance is more muted, the color becomes brighter and more intense as we move closer to the viewer. 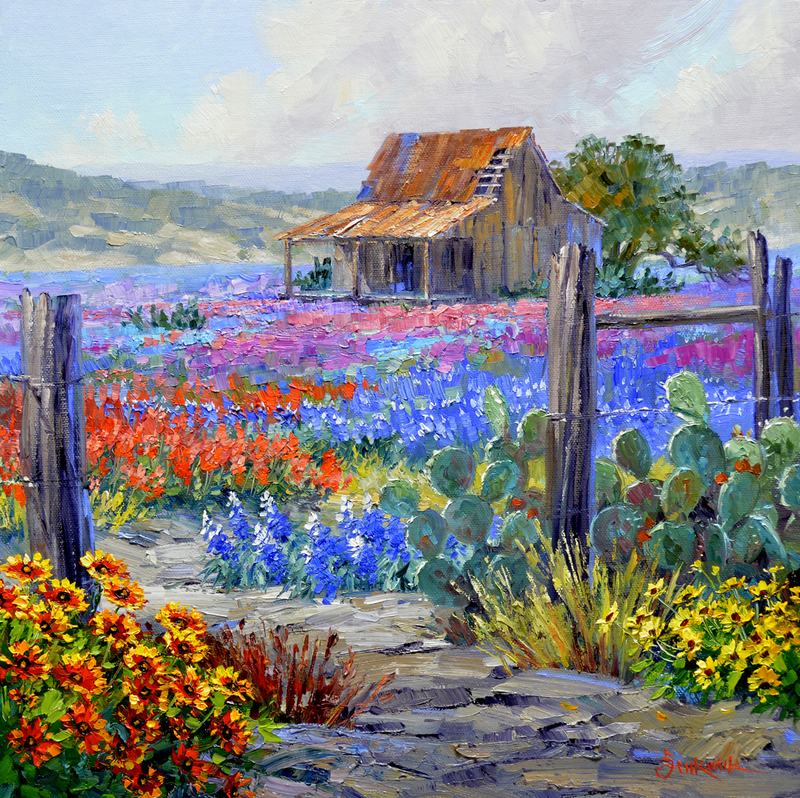 Following this simple rule helps to give the feeling of distance in the painting: Muted Colors Recede; Bright, Intense Colors Come Forward. 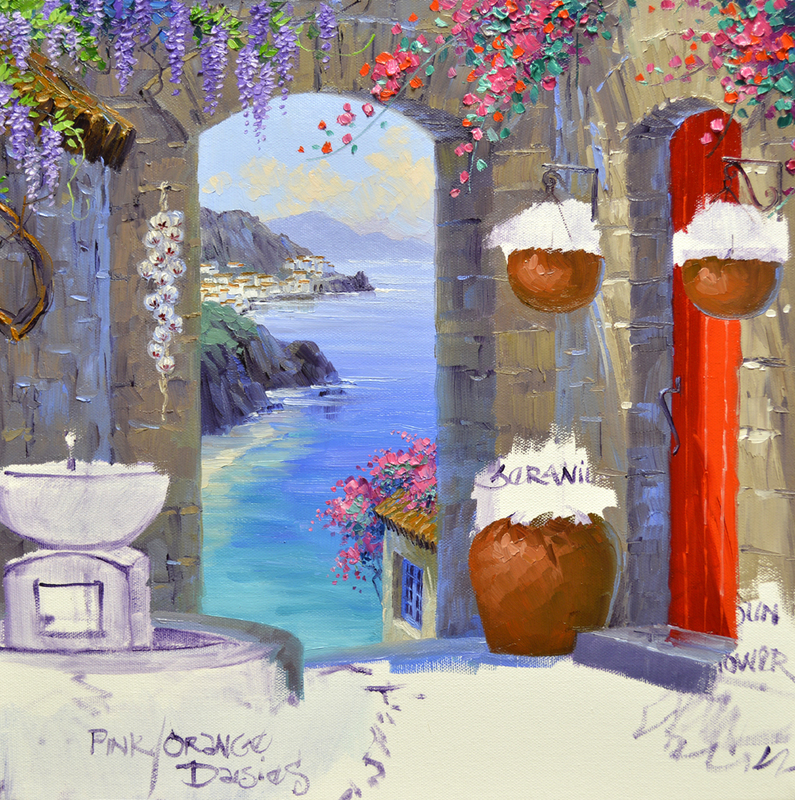 Now I concentrate on the quaint village of Amalfi. 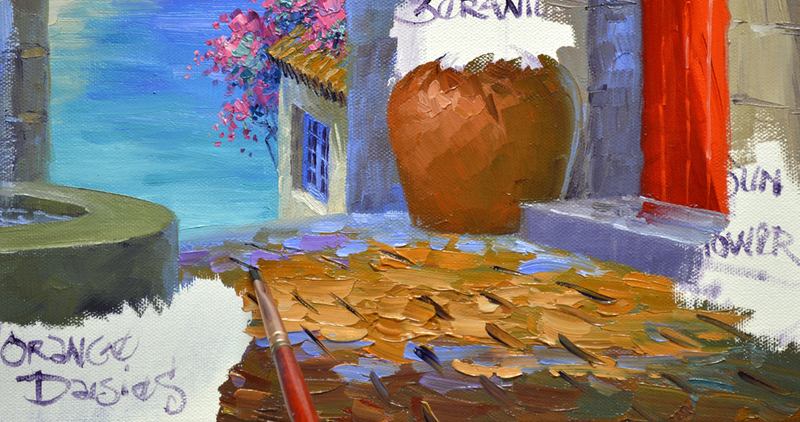 My wrist is braced against the mahl stick, steadying my hand as I delineate the fine details of the buildings. The closest bluffs are made darker so the distant village glows. A small beach along the base of the rocks beckons the viewer to “Come take a dip”! The villa below our vantage point is draped in a cascade of Bouganvilleas. The hot pink pops against the azure water in the distance. Thank you for following along today. If you would like to receive an email every time I publish a new post please feel free to subscribe to my blog. CLICK THIS LINK and scroll to the upper right side of the page. You will see a heading EMAIL SUBSCRIPTIONS. Just enter your email address and click the button “Sign me up!” It’s easy. And if you enjoy my blog please CLICK the FaceBook LIKE Button. As we say in Texas, “Much Obliged! Now for something completely different on my eBay auction. Poking around in our workroom I found some cool palettes. 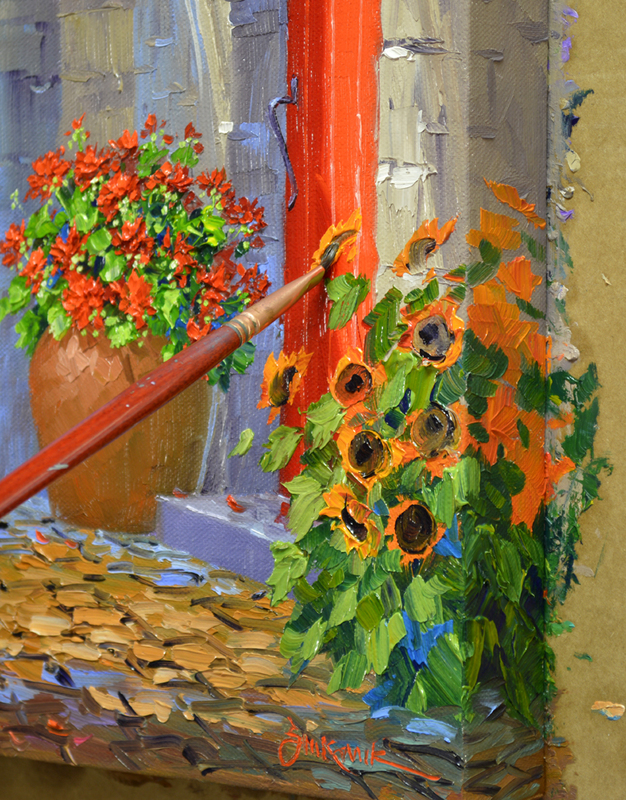 The rich patina of paint remnants, ALL MIXED UP on the wood surface provides an exciting backdrop for a unique original oil painting! So I’m calling these Palette Paintings, “ALL MIXED UP”! To go directly to the auction CLICK HERE! It’s Springtime, Irises abound! 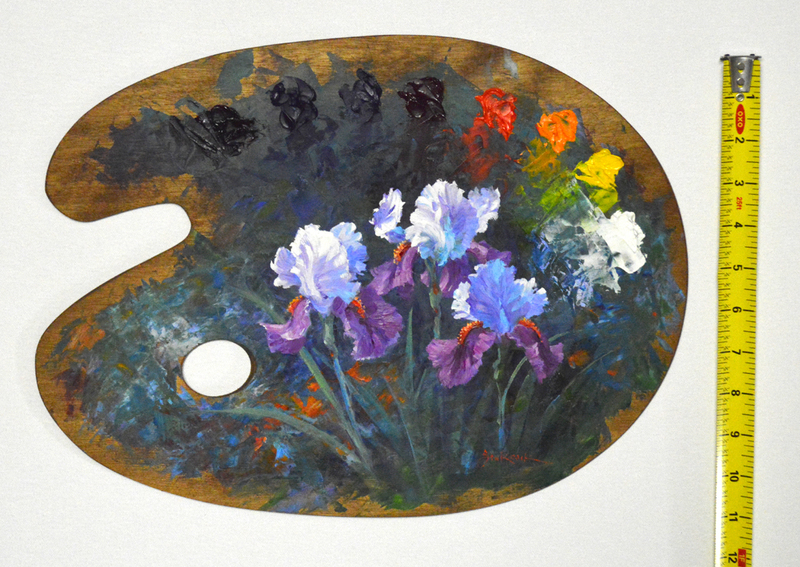 The dark background on this palette is perfect for some white and lavender ones. 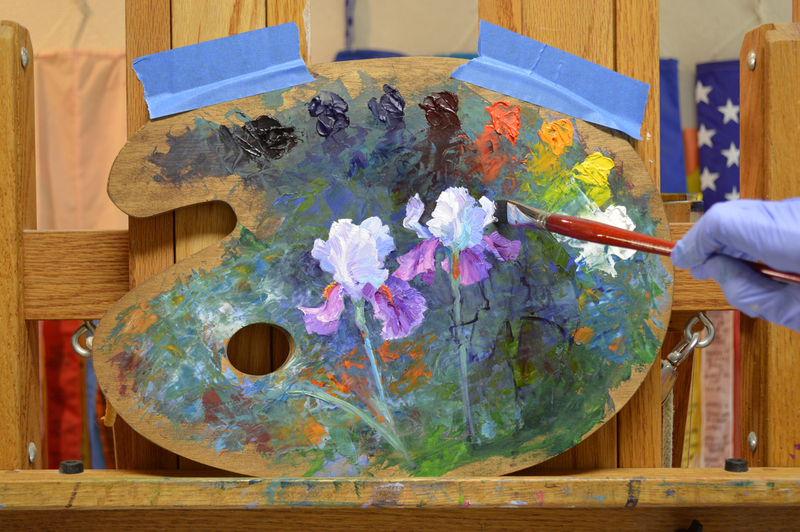 The individual blooms are roughly outlined, then I begin applying opaque oils. 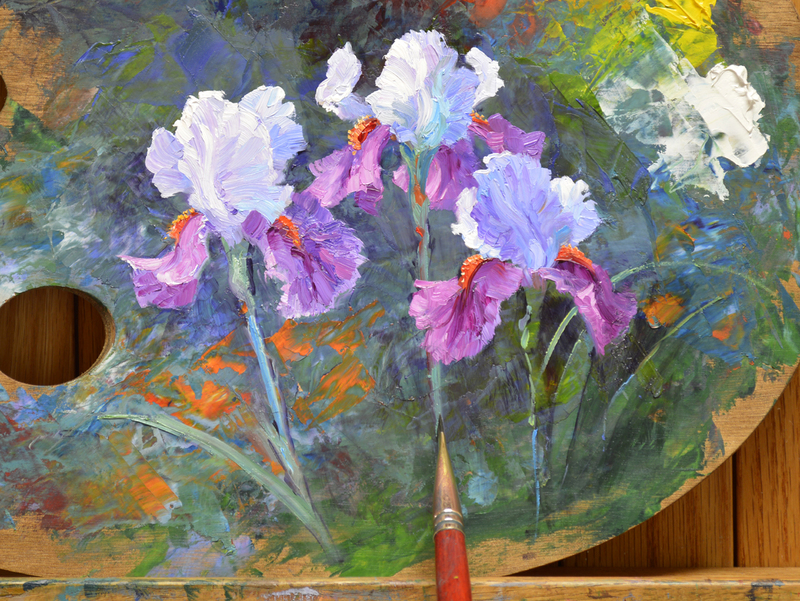 I let the orange on the palette pop through the foliage and stems of the Irises, giving the impression of flowers planted in the distance. 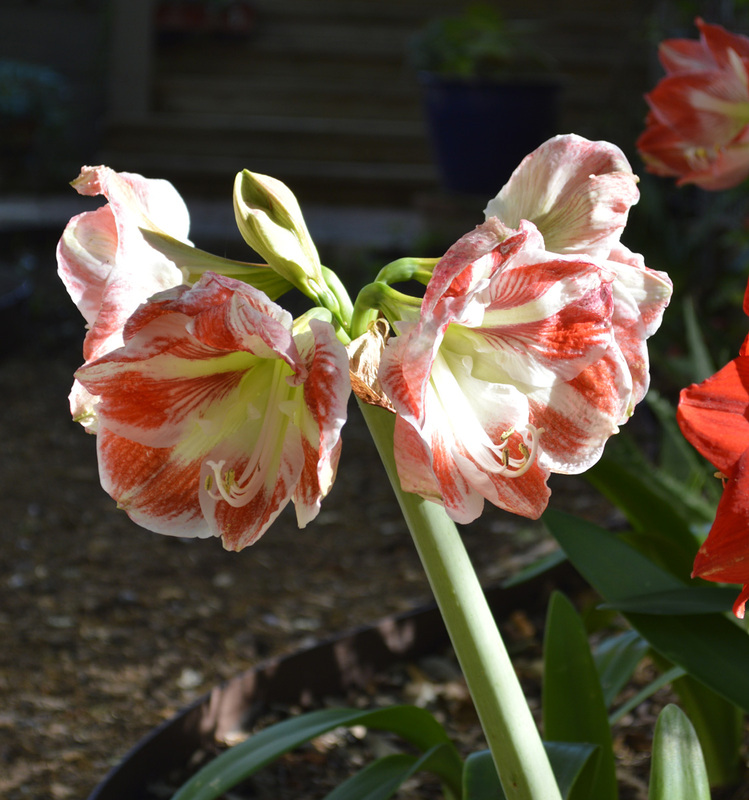 The Lustrous Blossoms of one of my favorite flowers dance in the warm sunshine! 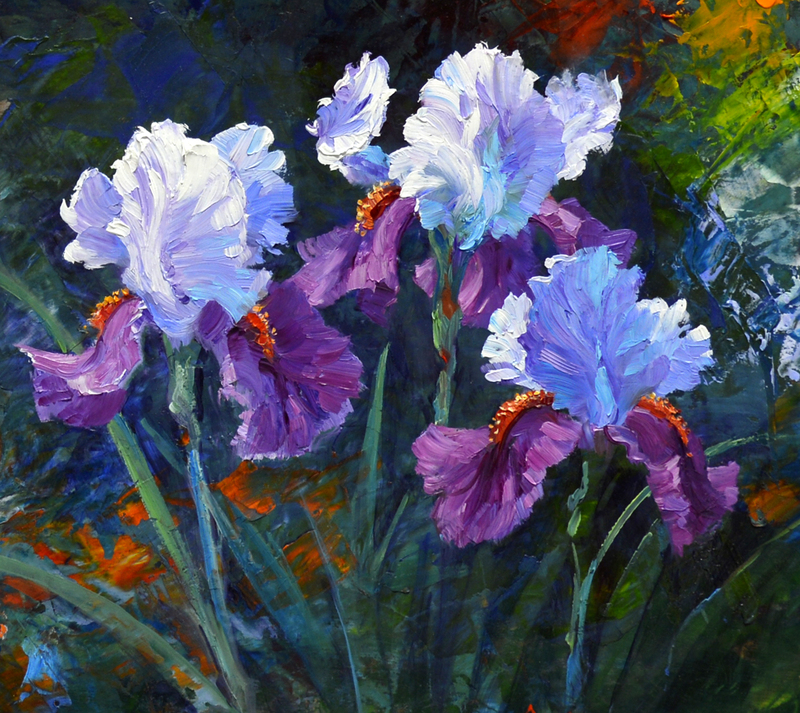 Enjoy the delight and excitement of spring Irises every day of the year in your home or office. No Frame is necessary. 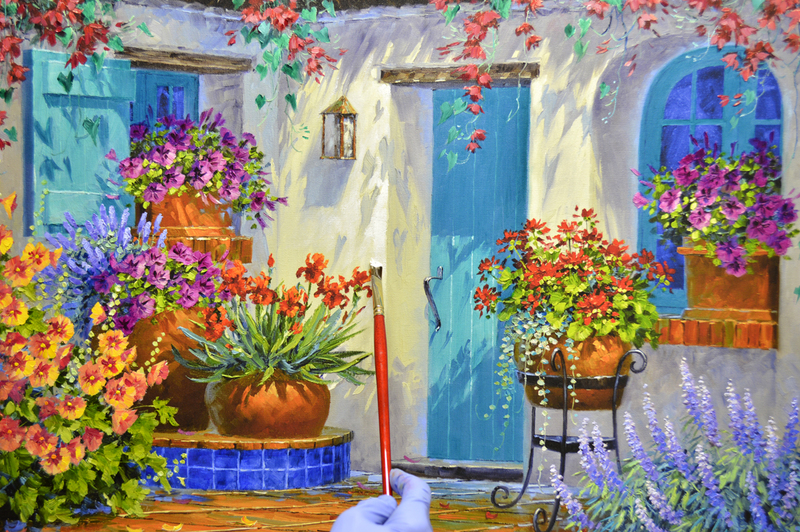 Just place Lustrous Blossoms on a small easel on your mantle or coffee table where you are able to view the painting up close and enjoy the detail! Here’s a closeup of the Irises. You may click on the image to see it larger. 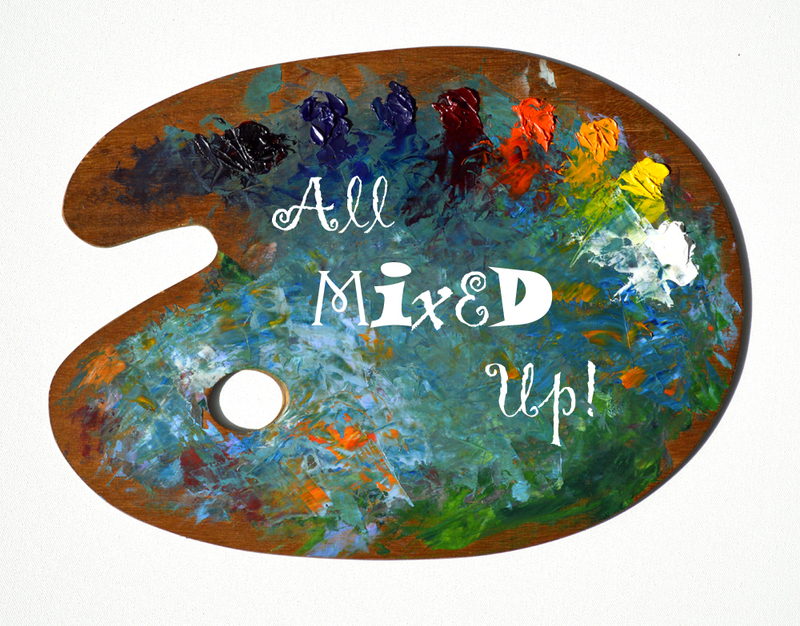 The ALL MIXED UP! 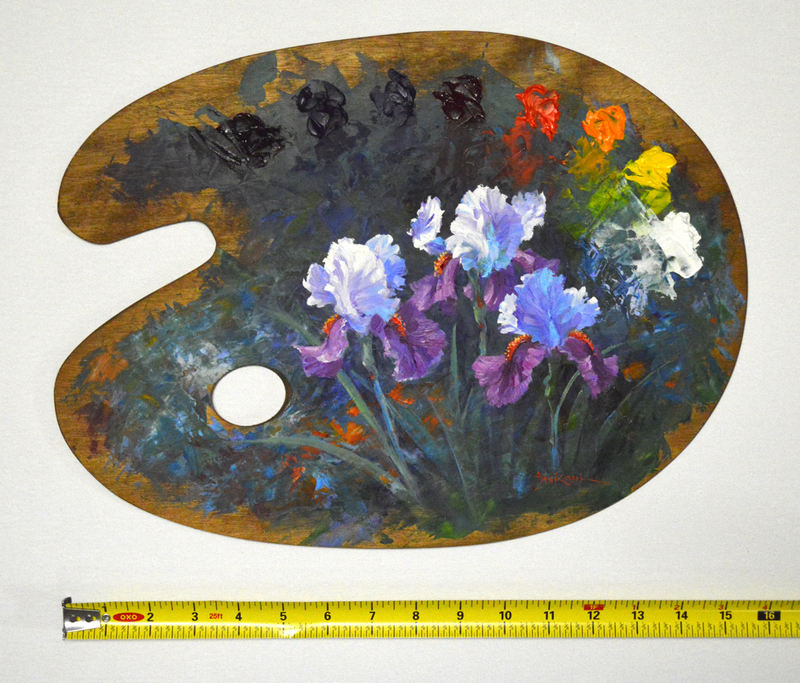 Palette Painting is 15 1/2 inches wide………. And 12 inches tall. 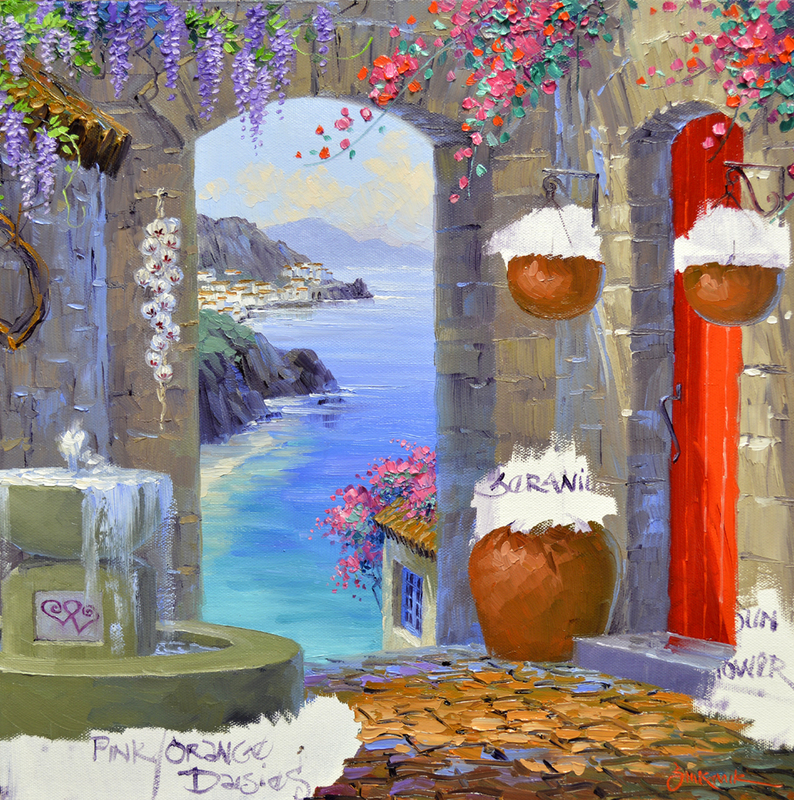 This Senkarik Original Oil Painting on the Palette would retail for $500. BUT….to make it fun the BIDDING STARTS AT ONE CENT! That’s right, ONLY A PENNY! Our Lord has so blessed me with every one of you. Your friendship, continued support, thoughts and prayers have been incredibly wonderful. The beauty God created leaves us in total awe. We live in peace and tranquility knowing He gave His only son for us. Because of Jesus’ suffering and ultimate sacrifice of His life on the cross we know one day we’ll all be with our Jack again for eternity in Heaven. 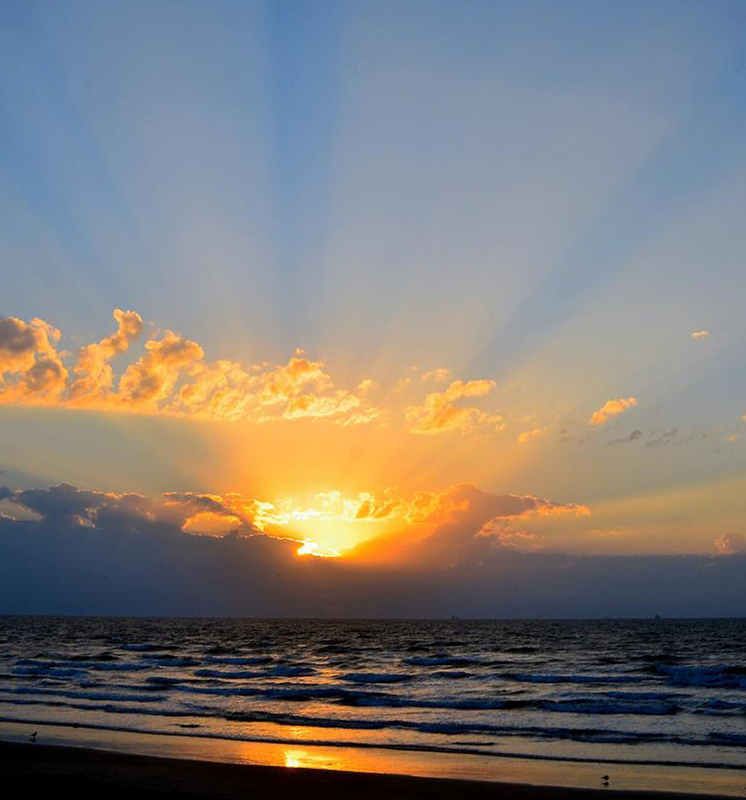 Every single sunrise is a beautiful reminder of God’s sacrifice and promise. What a huge comfort. I thank you for being part of Jack’s and my life. All my best wishes to you for a Joyful and Peace filled Easter. 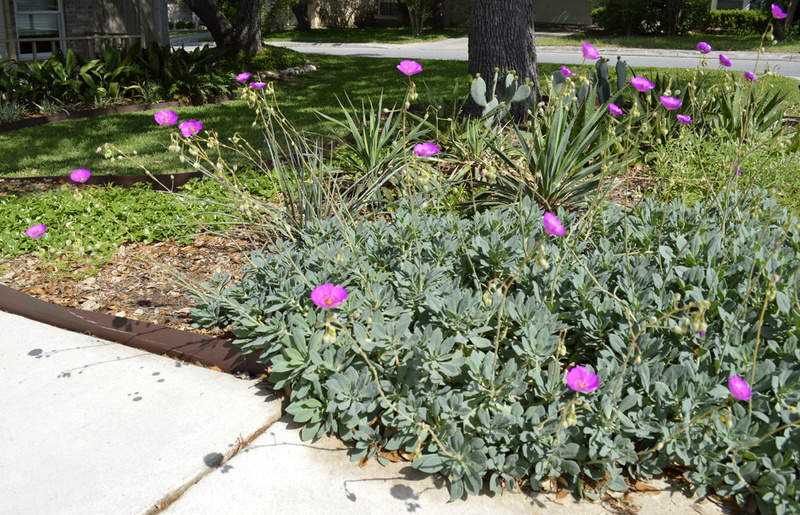 The prickly pear cactus is blocked in with greens left over from the wildflower field. A #16 Bright (square) brush is used to make the oval pads. 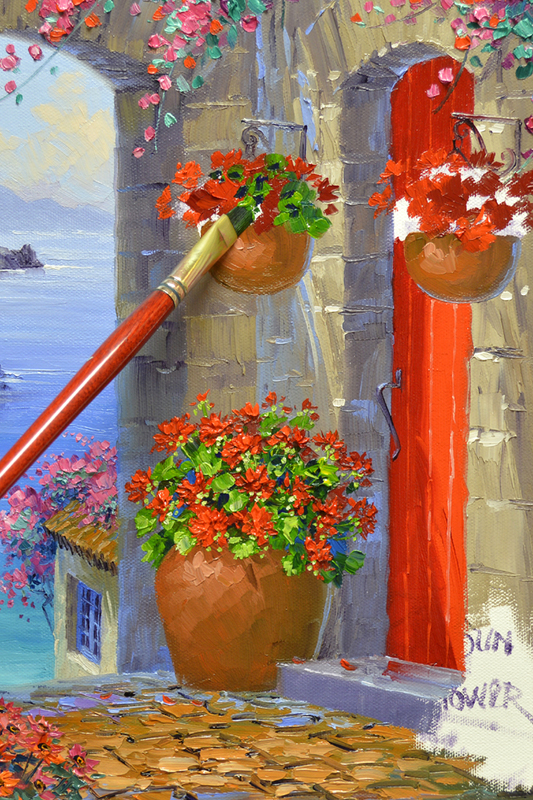 I just lay the brush, loaded with paint, on the canvas and give it a twist! The rims, or thin edge of the pads, are highlighted where the brilliant sunshine illuminates them. Then the needle like spines are delineated. I don’t try to show all of them, just a few here and there. You may click on the image to see it larger. Buttery yellow Coreopsis nestles at the base of the sticky cactus. 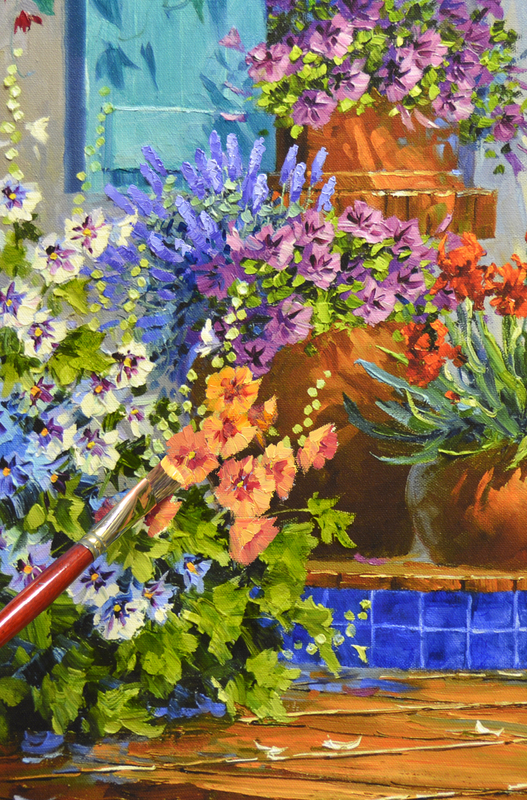 The flowers are blocked in first with mixes of Cadmium Yellow Medium + MUD (Ultramarine Blue + Alizarin Crimson) + a touch of Lemon Yellow and Pure Lemon Yellow. The leaves are combinations of Ultramarine Blue + Lemon Yellow. I’ve been without email for a few days! If you’ve emailed and I haven’t responded that’s why. Your correspondence was lost in cyberspace. It’s not been exactly fun getting it all resolved but I’m finally back up and emailing again. WHEW! So thank you for your patience; you may email me again! ALL RIGHT…..let’s get to work. 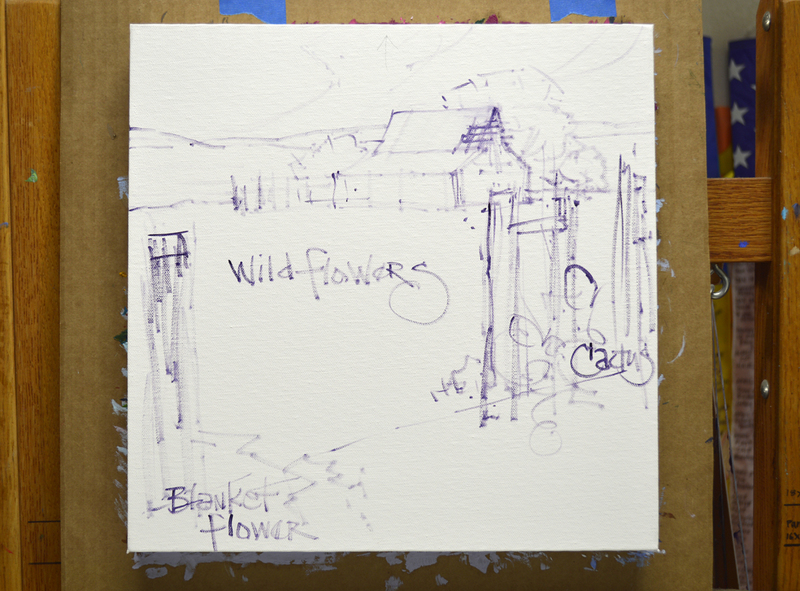 The wildflower field is blocked in with mixes of Cobalt Blue + White and Ultramarine Blue + White. Bands of Magenta + White and Dioxazine Purple + White flowers are added in the mid portion of the pasture. 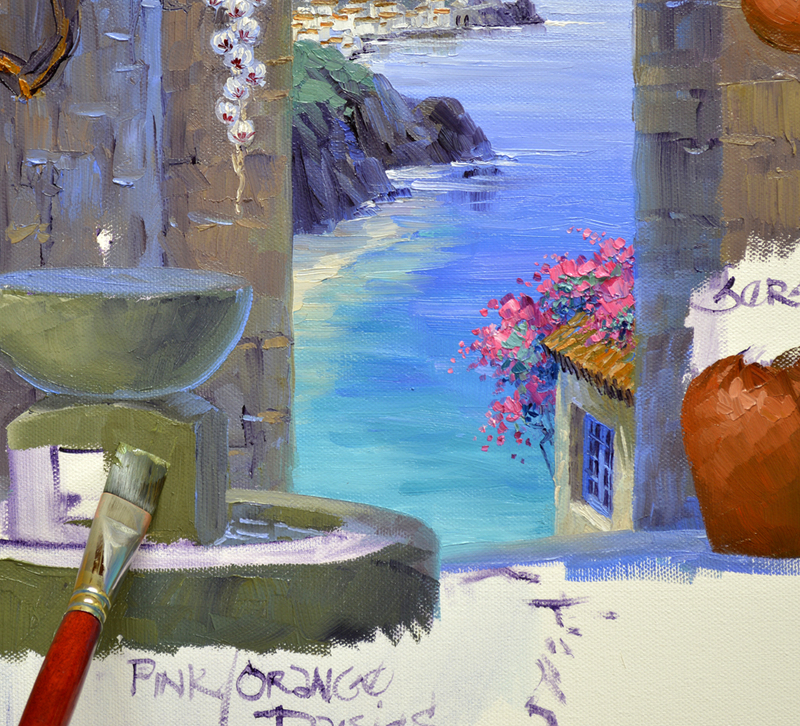 The ledge rock serving as a road is painted with mixes of Cadmium Orange + Ultramarine Blue + White. 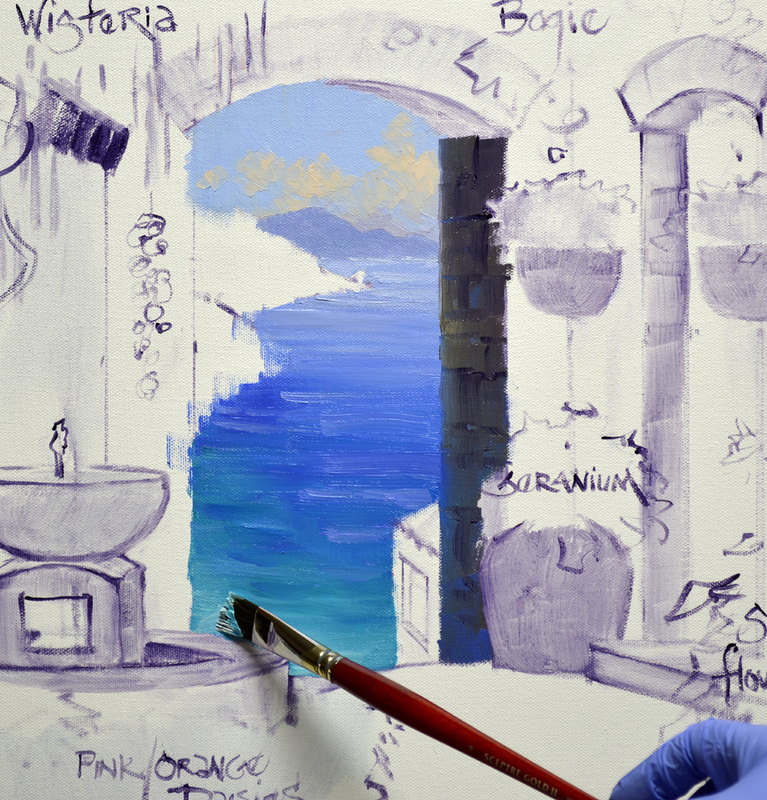 MUD (Ultramarine Blue + Alizarin Crimson) is added into the mixtures for the darker shades. 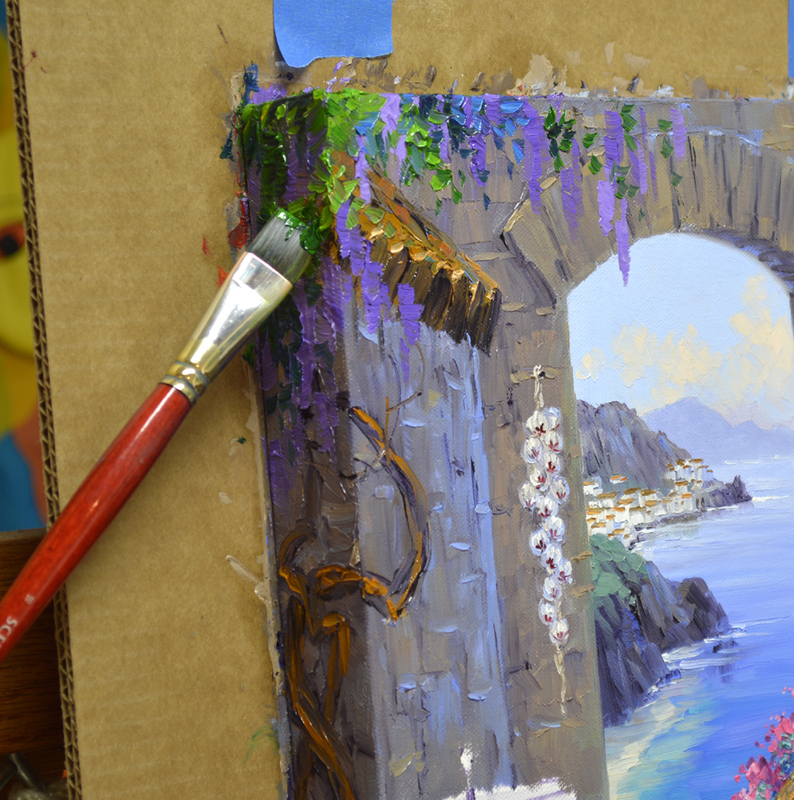 The canvas, mounted to a piece of cardboard, is laid flat on my taboret to paint the bottom edge. You may click on the image to see this larger. 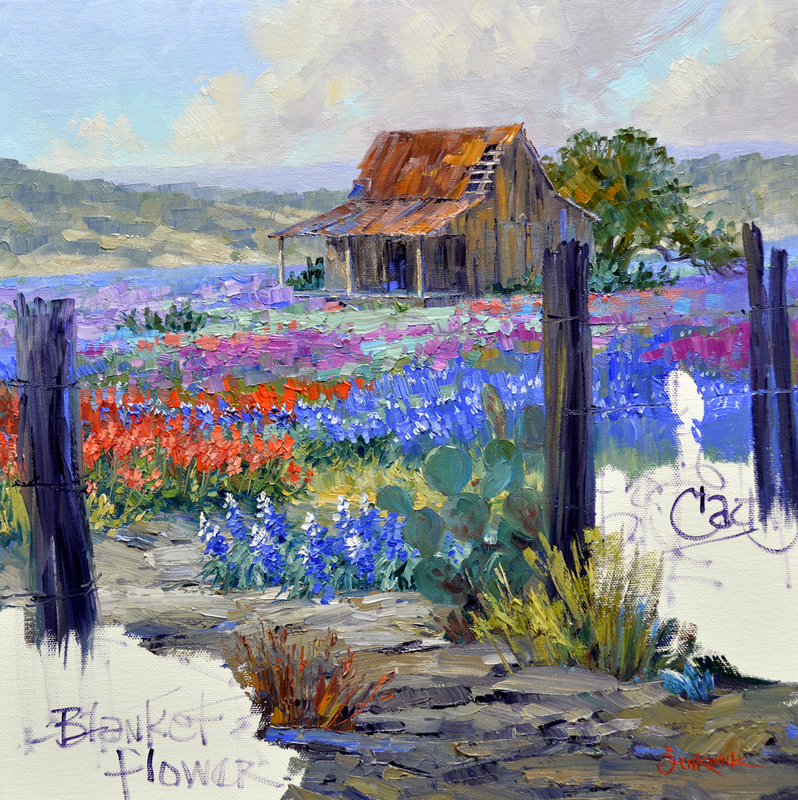 A shot of light slides in behind a clump of Indian Paintbrush interspersed among the Bluebonnets. 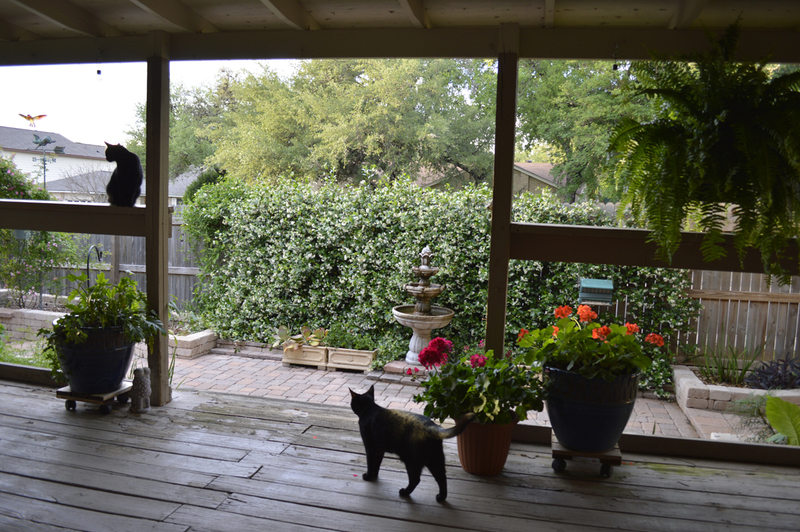 I’m thoroughly enjoying our Texas spring. 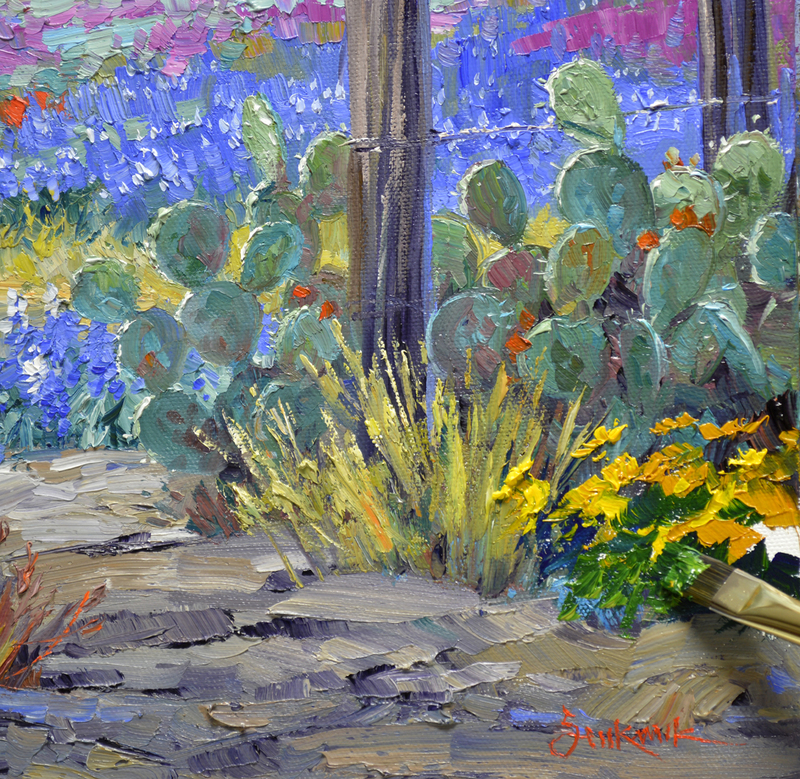 So….let’s paint a little touch of Texas for our gallery in New Mexico, Santa Fe Art Collector. I make a quick sketch. My plan is transferred to a 14 inch by 14 inch canvas. Please remember, as you read through my blog, you may enlarge any of the images by clicking on the picture. We begin with the sky. My colors are mixed and we’re ready to begin painting. The recipes are as follows: #1. 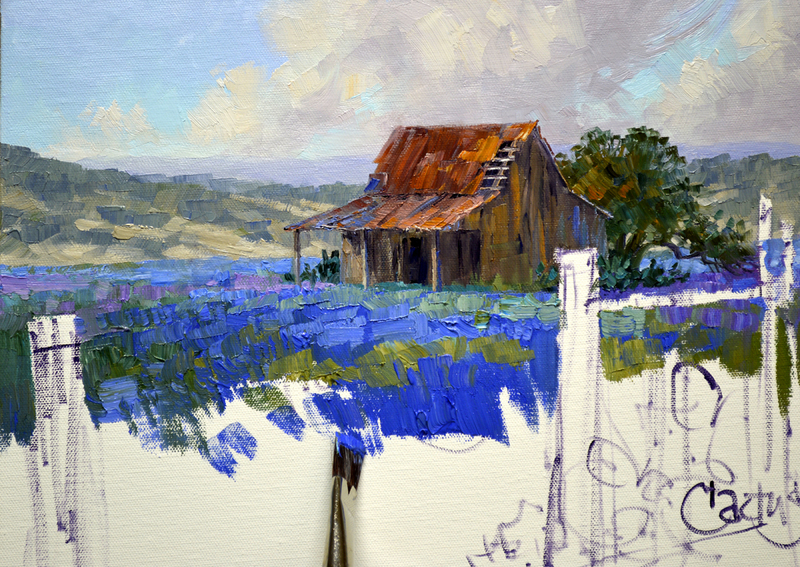 White + a touch of Pthalo Blue + a little Cadmium Orange. #2. White + Pthalo Blue. #3. White + Cobalt Blue. #4 White + MUD (Ultramarine Blue + Alizarin Crimson). #5. Mixture #4 + more White. #6. White + a bit of Cadmium Orange and a small amount of Mix #5. The blue field of the sky is blocked in first. Mix #3 is used near the upper part of the sky, #2 in the middle and #1, the lightest mixture, at the lower portion nearest the distant hills. Sweeping clouds are then added. Painting them wet-into-wet allows me to keep the edges feathery soft. The most distant hills are painted bluer so they will recede. The closest ones are made with warmer colors. I love the old structures you see in the Hill Country. Unfortunately they are quickly disappearing. But that’s the fun of painting, we can keep them alive in our art! Rusty tin covers the roof, it’s blocked in with combinations in differing proportions of MUD + Cadmium Orange + Alizarin Crimson + White. 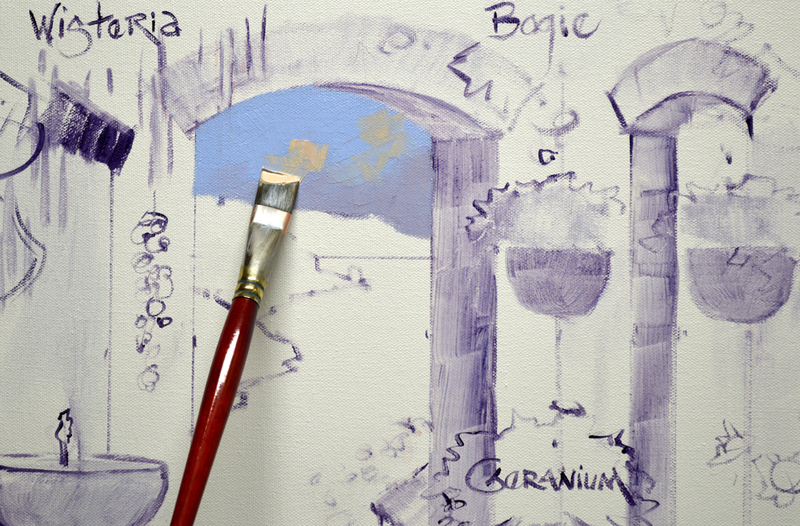 A few strokes of Ultramarine Blue + White are brushed here and there to bring variation to the old metal. 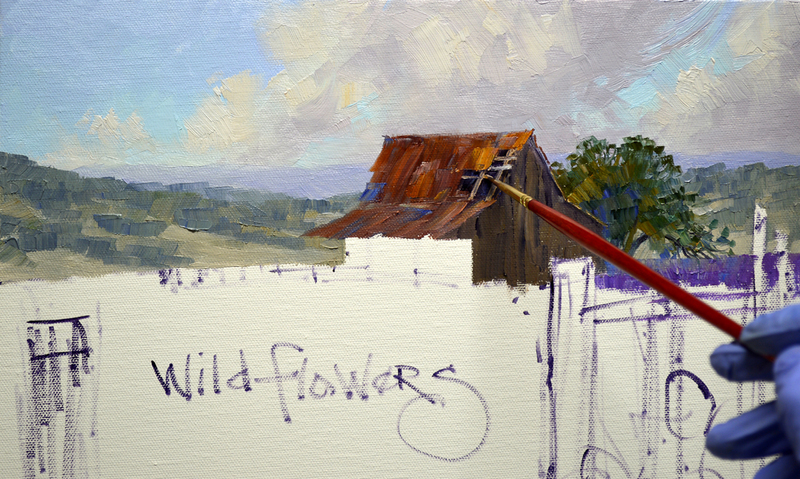 It’s fun painting the exposed rafters where a few sheets of tin have disappeared. 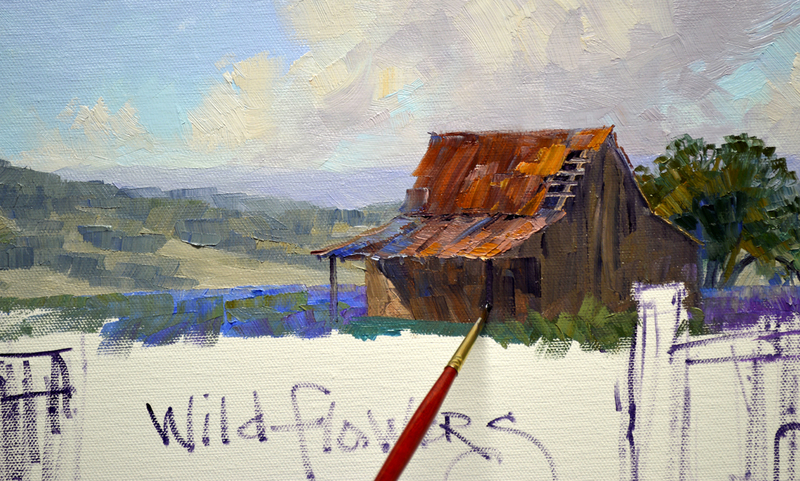 The weathered wood of the aging structure is made of several mixes of Ultramarine Blue + Cadmium Orange + MUD + White. 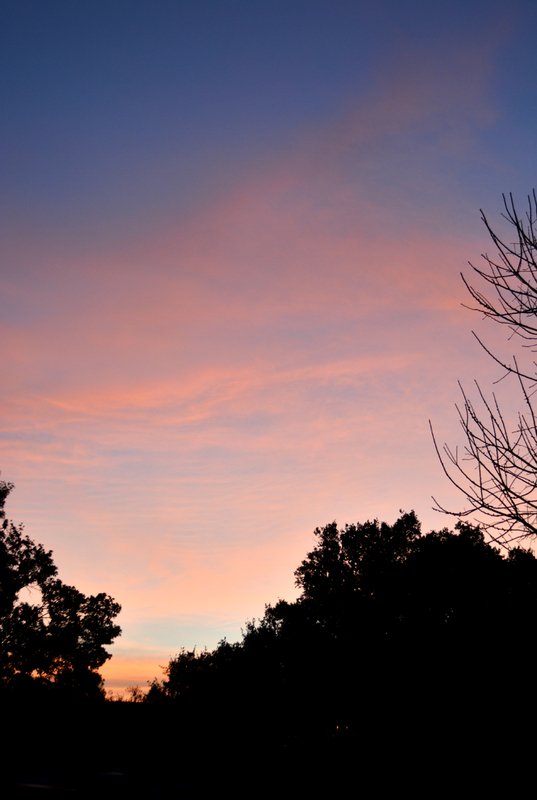 The sky was absolutely beautiful this morning. I think God asked every artist in Heaven to help him provide an amazing start for our day. Can’t you just imagine Jack, up there with all of the other Masters wielding huge paintbrushes painting our gorgeous sunrise? 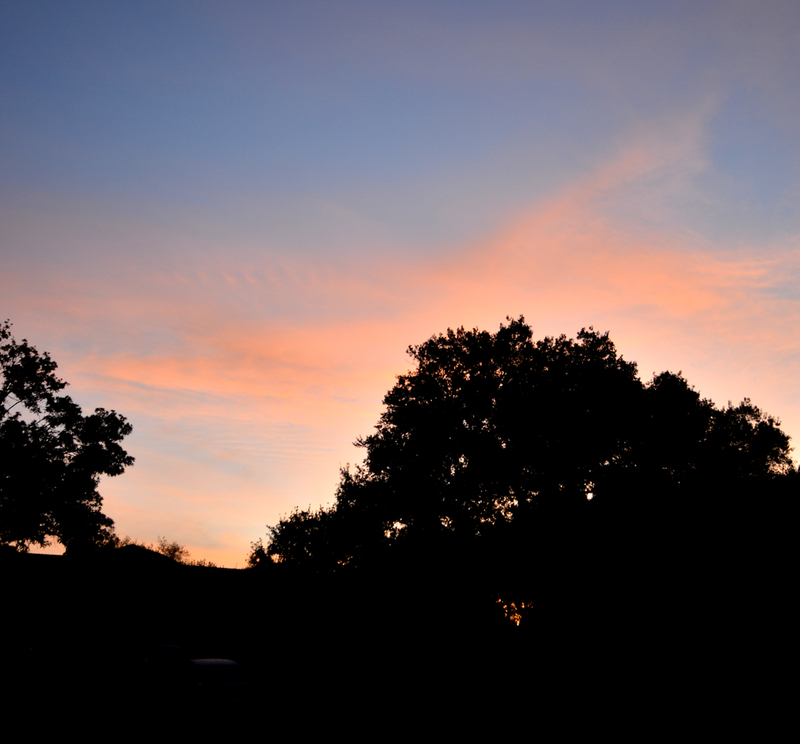 God’s beauty surrounds our pleasant little studio. Here’s the view out the front door. 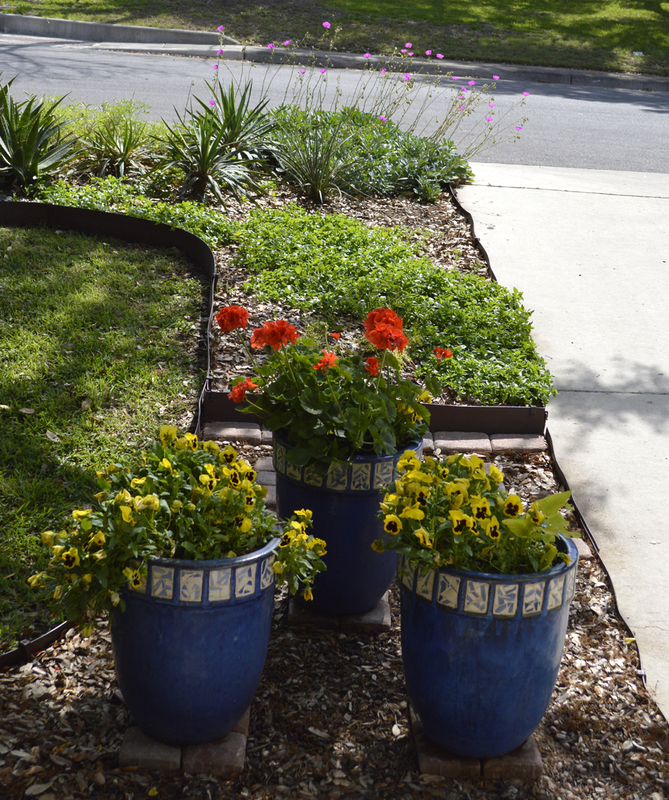 The plants at the far end of the planter are Rock Purslane. Here’s a closeup. 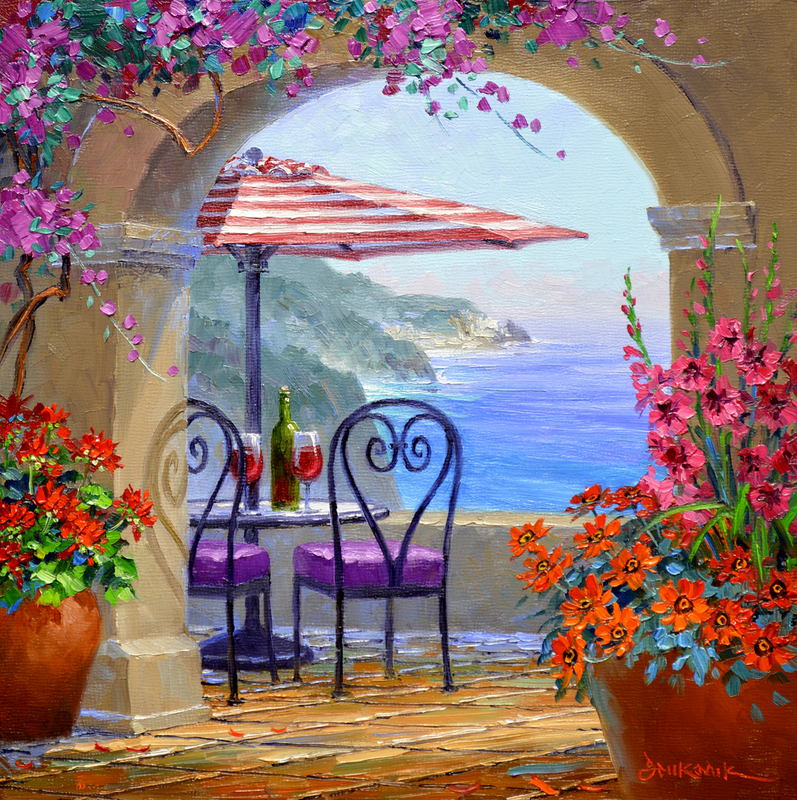 I love the way the hot pink blossoms bob and dance in the gentle breeze. 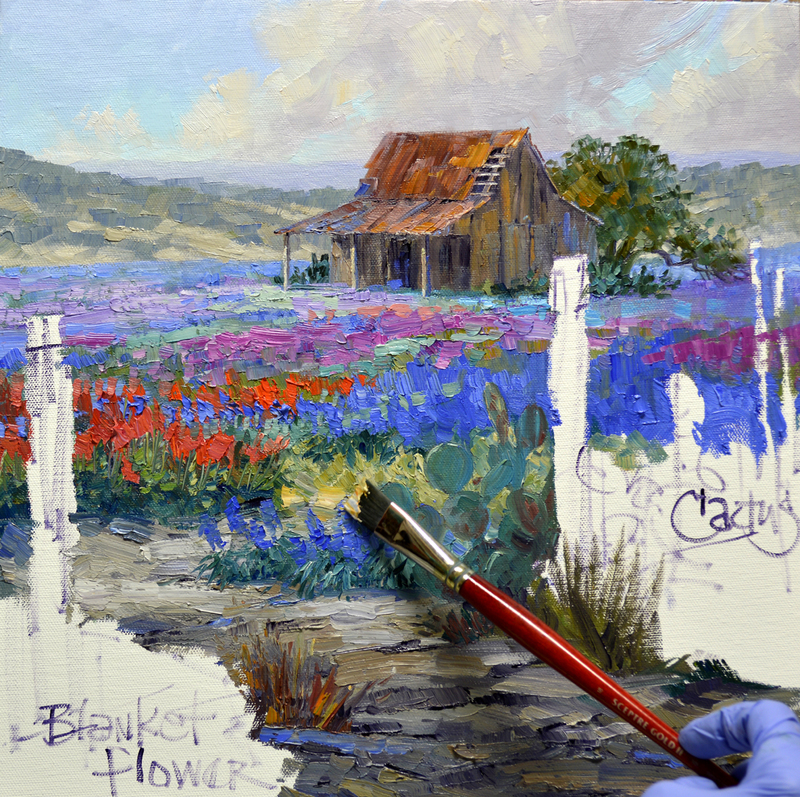 Some wayward Bluebonnets even surprised me this spring by popping up right by Jack’s name on our Jack-N-Mikki medallion in the kitchen garden. 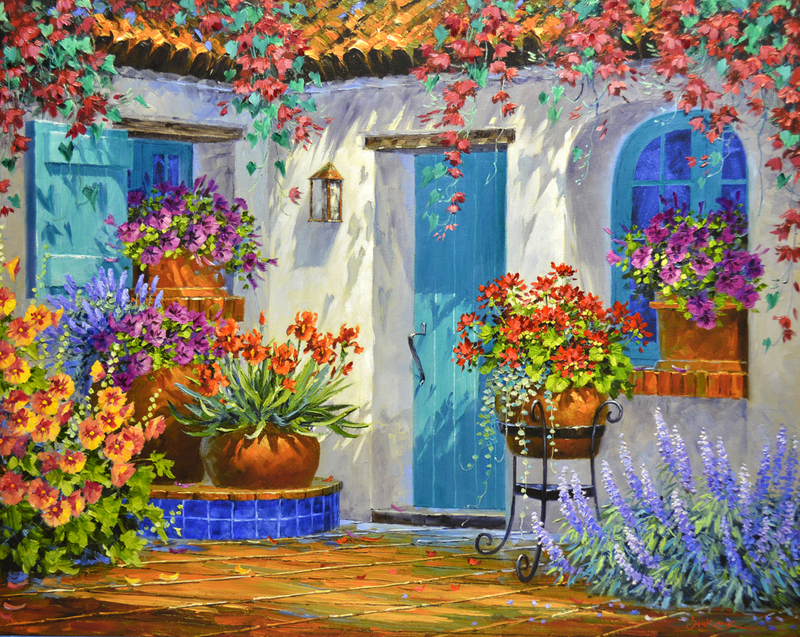 You may click on the image to enlarge it to see Jack’s favorite flowers even better. 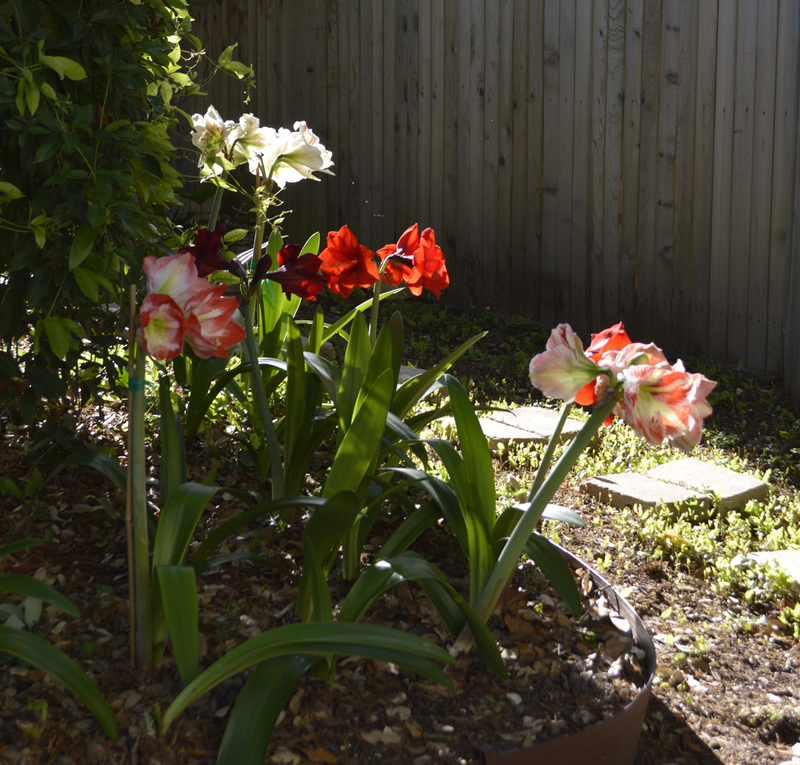 And the Amaryllis survived Percy the Possum. The blooms are huge this year. This one is especially pretty. I think it’s called Samba. 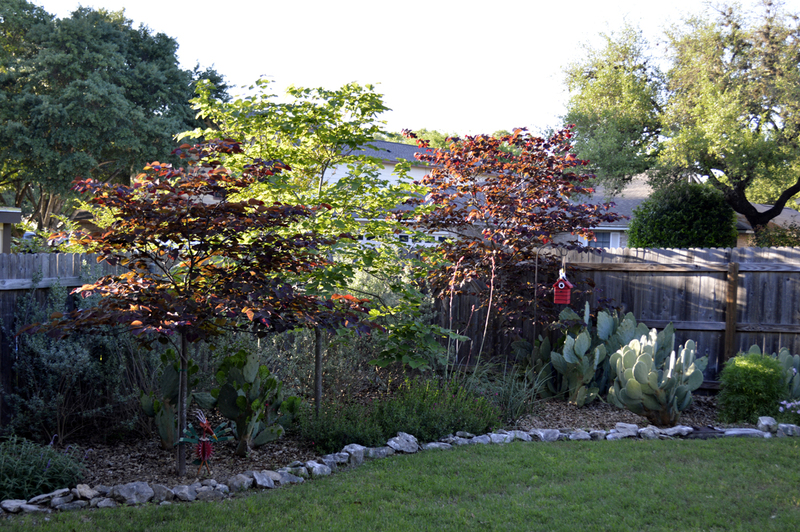 Pinkie, Rosie and Ruby, our Redbud Trees, are now covered in heart shaped leaves. 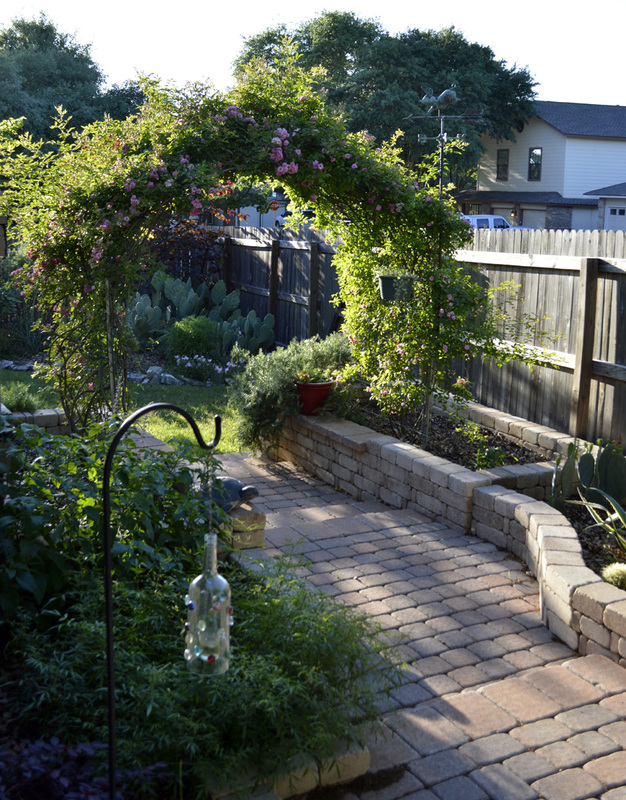 The Peggy Martin Rose on the arbor is full of buds, can’t wait to see it in full bloom!